We’ve lived in this house for three years now. 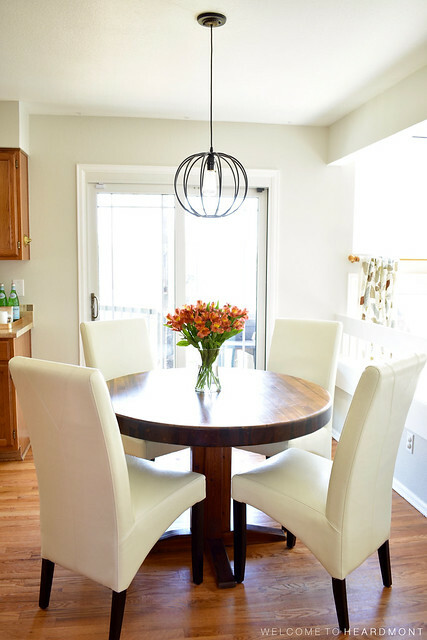 Pretty quickly after we moved in, we decided to nix the formal dining room and dine solely in our eat-in kitchen. We didn’t have a table that fit the space at the time, so after some hunting, we found this awesome round table at a vintage shop nearby. 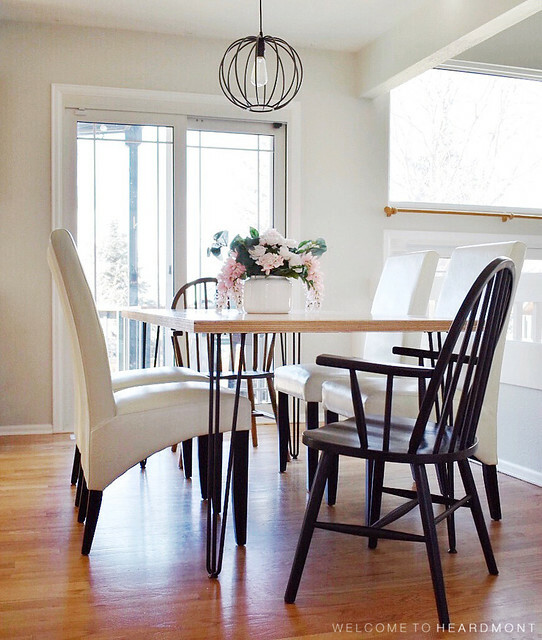 This table served us well, but once the four of us were all dining at the table (instead of three with the baby in a highchair), it became difficult to serve food from the middle of the table and impossible to host friends and family for meals. 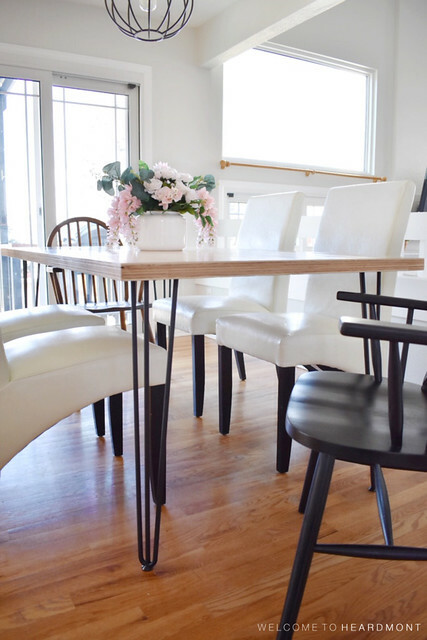 I’d been looking at dining tables on Craigslist for a few weeks with no real luck when I was given the opportunity to try a set of hairpin legs from The Hairpin Leg Co. (SPOILER ALERT: They are awesome!). 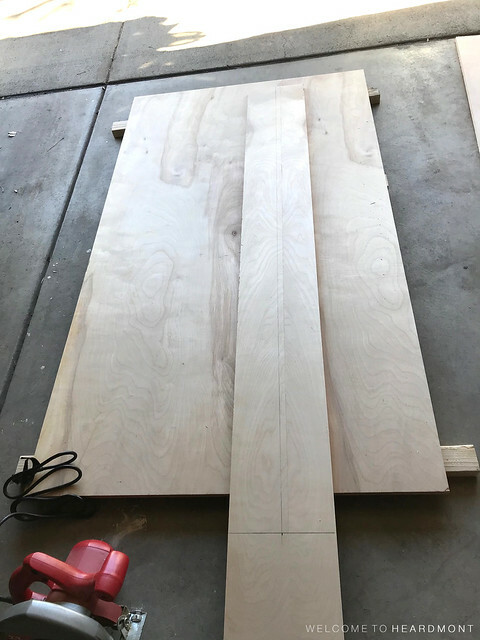 We decided to order dining height table legs and make our own table top for a completely custom dining table built to fit our space. 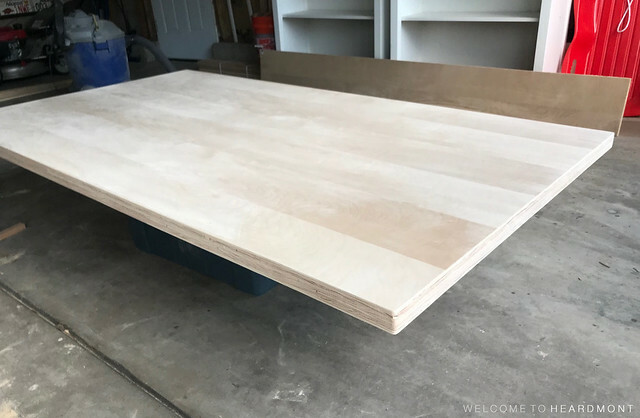 Our plan was to use the extra plywood to build a frame around the bottom of the table top for a few reasons. This gives an idea of how we cut strips for the long sides of the table from the long piece of scrap plywood. I believe these were about 4.5″ wide. The majority of the cuts on this project were made with a Skil Saw like this one with a fine finish blade like this. 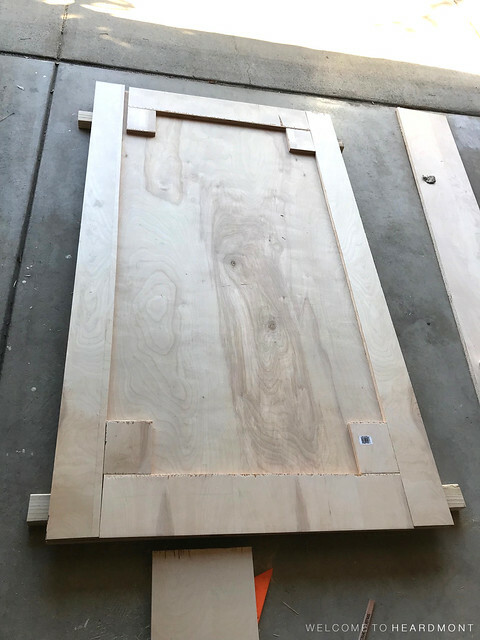 We knew the legs would be attached further in on the table top than our frame would allow, so we also added four scrap pieces of wood (roughly 5″ square) to the corners. To attach the frame, we applied wood glue and added textbooks as weights while the glue dried overnight. A glimpse into our college years, right here! 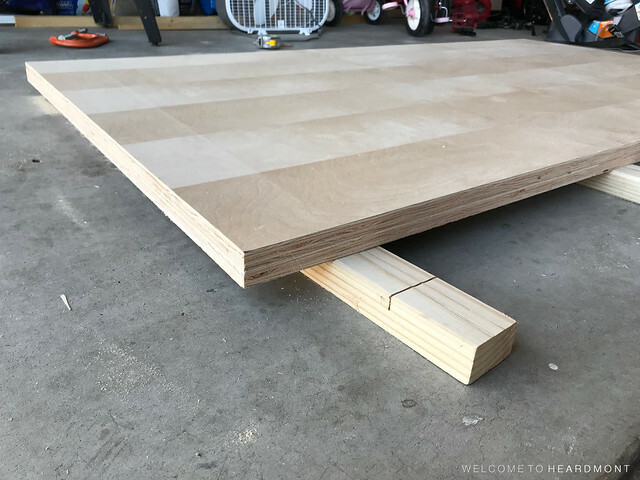 The next day, we clamped a straight board in place along one edge of the table top (to use as a guide) and used the Skil Saw to cut through both layers of plywood and create a smooth edge. We had a few areas in the wood we wanted to work around, but in general we cut an inch off each of the four sides. 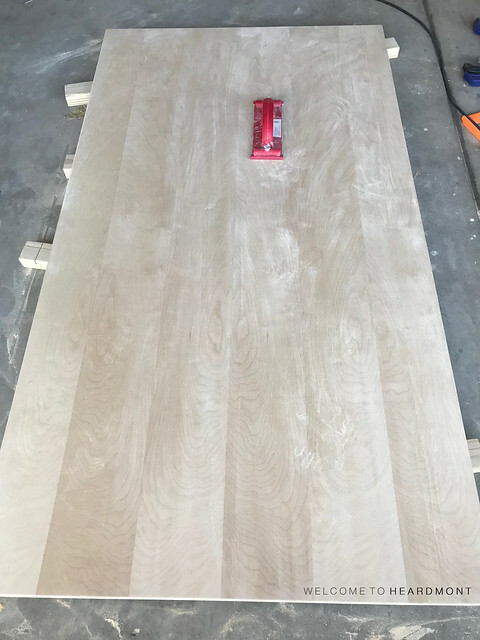 This is what the top of the table looked like after all four sides were trimmed. 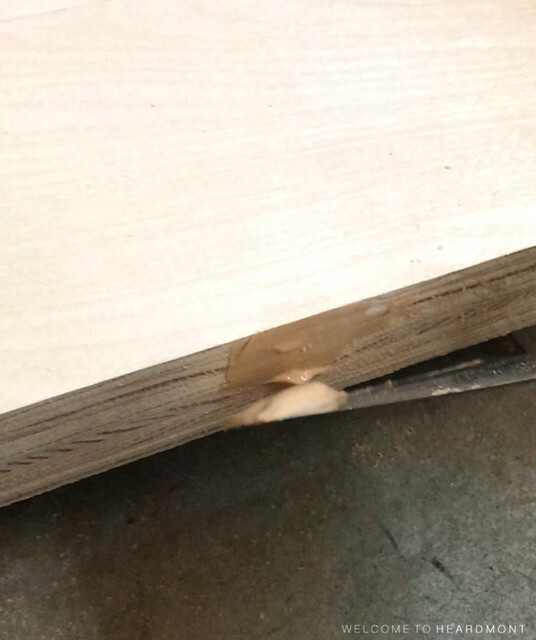 This particular sheet of plywood had one full veneer side and one with these veneer strips. I decided I liked this side better for our table top because it was more interesting. Here’s a look at the edges after the cuts. 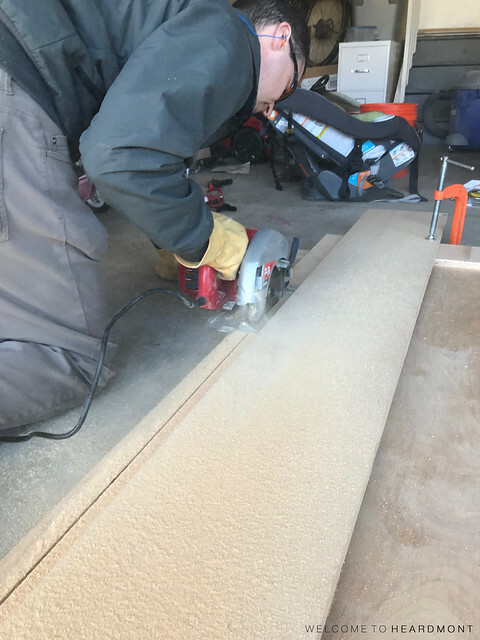 There were a few holes in the edges of the plywood, so the next step was to fill them with wood filler. 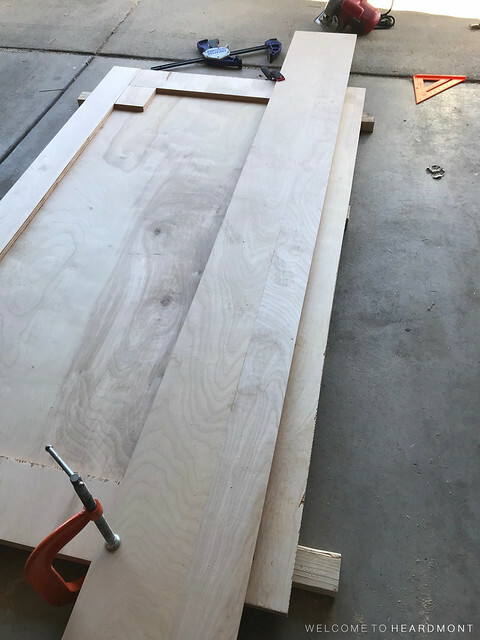 I used wood filler on any holes or gaps in the plywood on all four sides. After the wood filler dried, I hand sanded the edges and rounded the top edge and corners with 120 grit sandpaper. 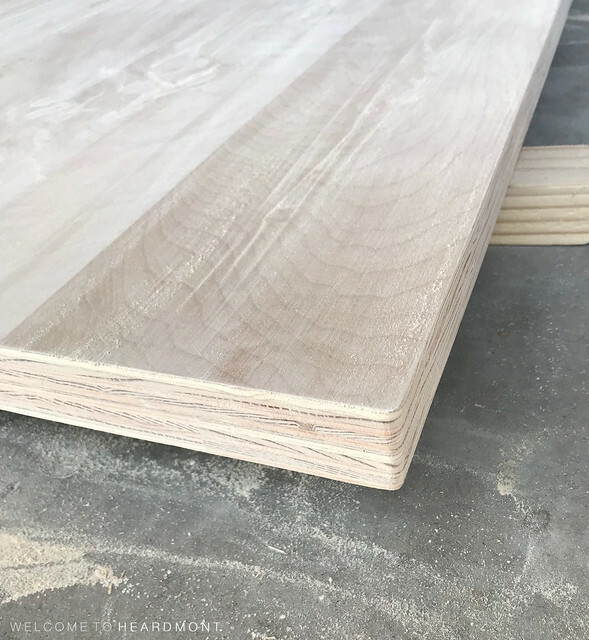 I used 220 grit on the top of the table to prepare it for finishing. 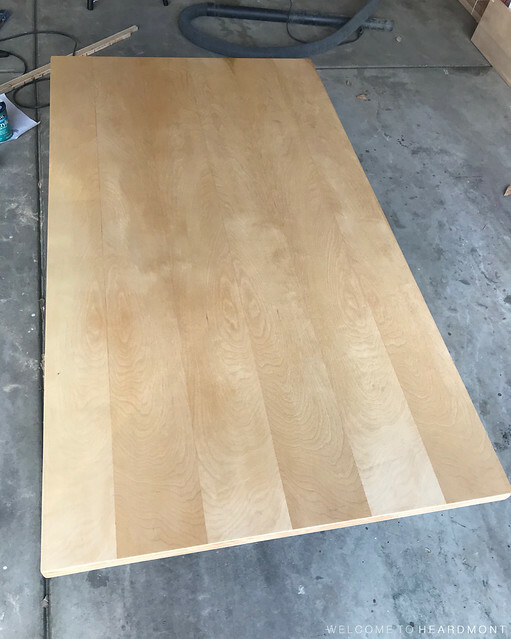 Here’s the table top after sanding. The rounded corners turned out really pretty and much safer than the sharp corners left by the Skil Saw. Finally it was time to seal the table top! 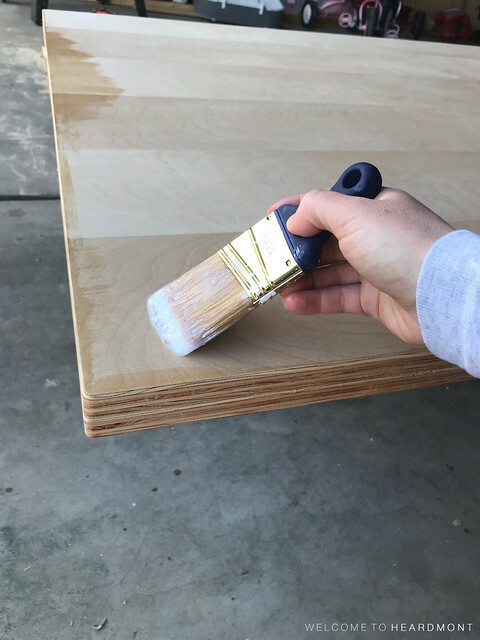 I used this poly and my favorite paintbrush ever to apply thin, even coats over the entire surface and around the frame on the underside of the table top. Two hours later, the table top was ready for a light sanding with 220 grit sandpaper and the second coat of poly. I applied four coats of poly in total, sanding with 220 grit between coats. Then it was time to attach the legs. 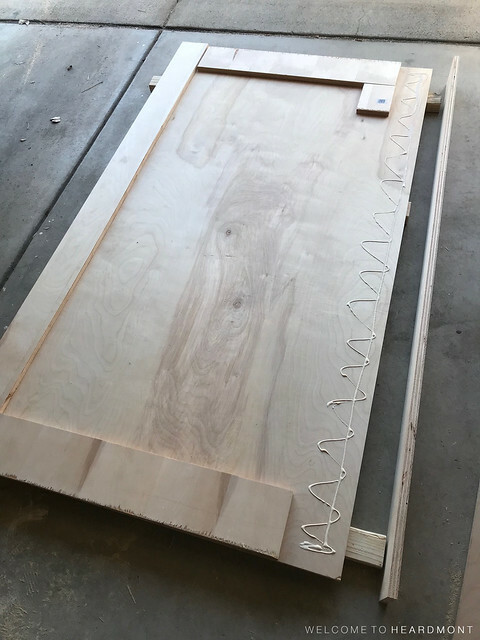 I carried the table top into our dining room and marked the screw holes for each of the four legs on the underside. 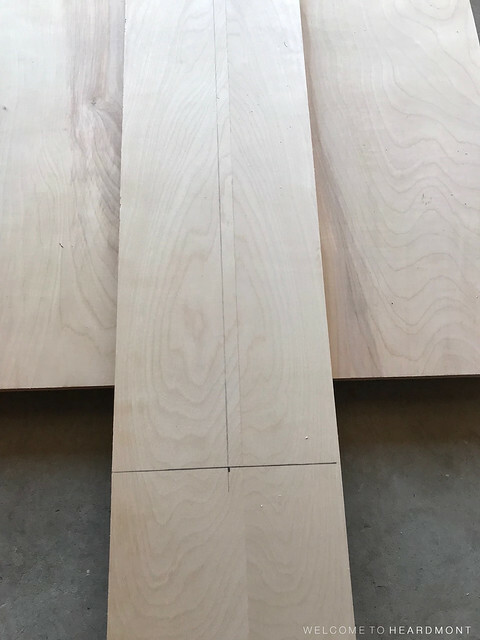 Our legs were inset about 2 3/4″ from each edge. Then I predrilled each hole and attached the legs with the provided wood screws. 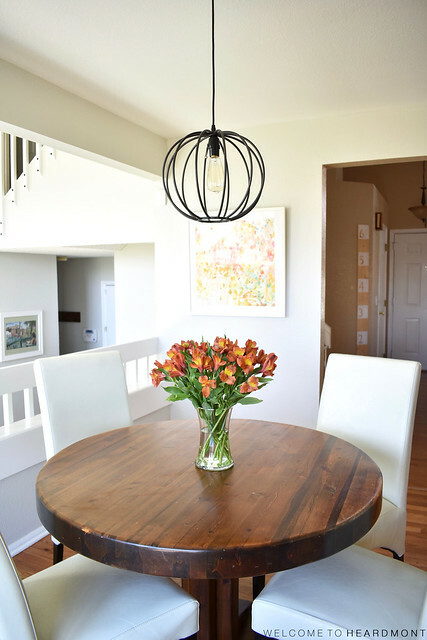 We ordered the 28″ heavy duty, 3 rod dining table legs in black (these from The Hairpin Leg Co.). 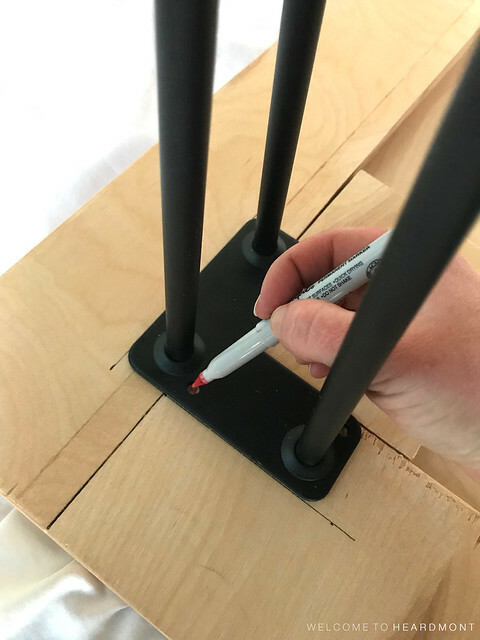 I think our selection was perfect for the size and weight of our table top, and I love that the legs came with the appropriate wood screws and these little black rubber protector feet. 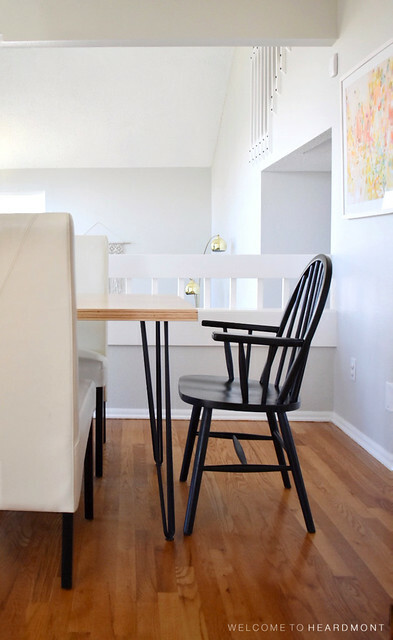 The feet keep the table from sliding and/or scratching our wood floors. 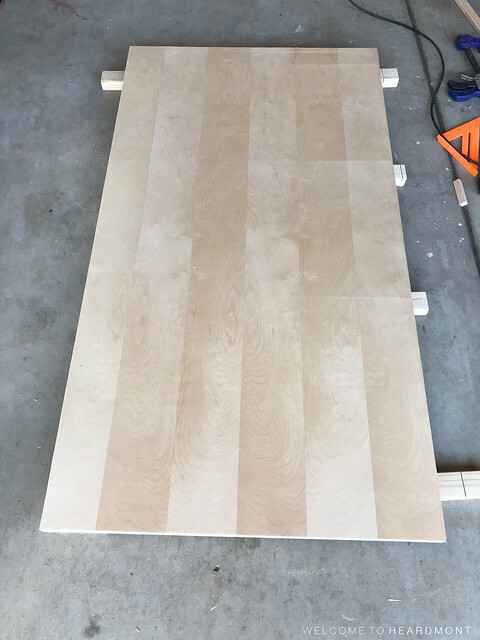 I’ve seen much thinner hairpin legs at hardware and craft stores, but now that I know how substantial the plywood table top turned out to be, I’m so glad we went with the thicker 1/2″ heavy duty legs. Here’s a look at how the table turned out! 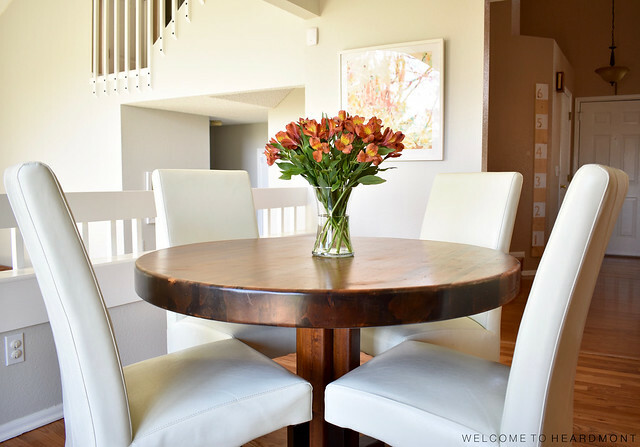 We are loving how large the table is without making the room feel crowded. It’s just the right size to seat six but could easily fit a couple extra chairs in a pinch. 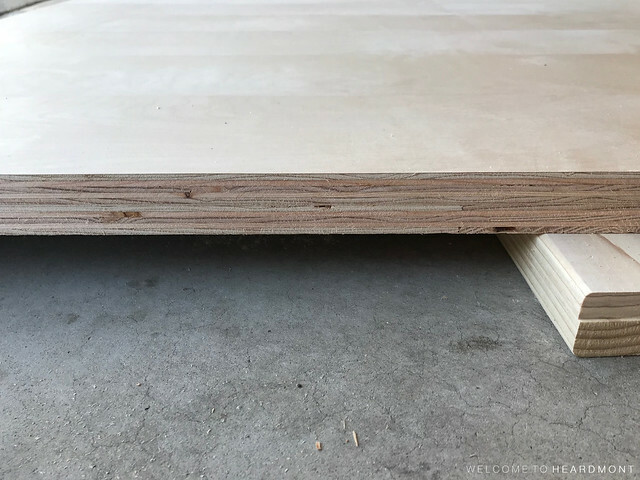 The layered plywood edge provides a bit of interest to the otherwise simple table top. I love seeing the textures and different shades of wood along each edge. I also love how the glossy natural wood pairs with the matte black legs! They definitely make the table. Now where’s my heart-eyes emoji? So that’s how we replaced our old dining table with one perfectly suited to our current needs. 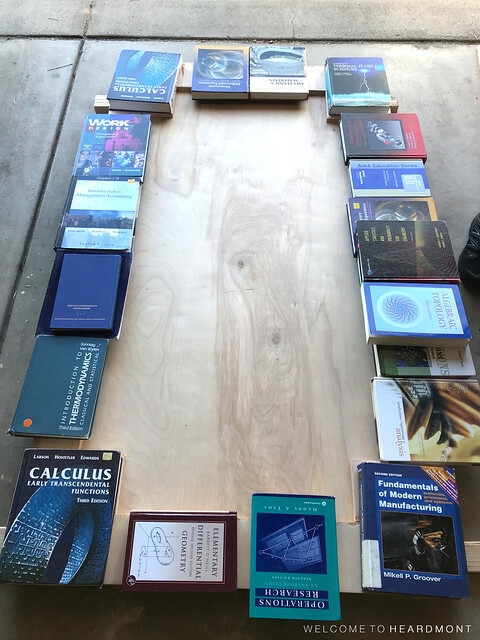 In total, this table would cost about $135-$140 to build on your own, depending on if you had the basic tools necessary already (saw, paintbrush, screwdriver and/or electric drill). In case you’re wondering, we didn’t get rid of our old table. It’s happily hanging out as a game/craft table in our newly remodeled den, but that’s a story for another day. 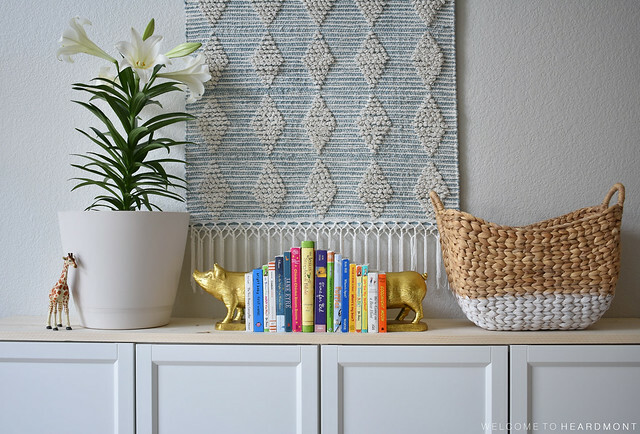 What do you think of our latest DIY? I’d love to hear if you make your own! Our master bath is still very much under construction, but I took a few minutes this week to spruce up our bedroom. 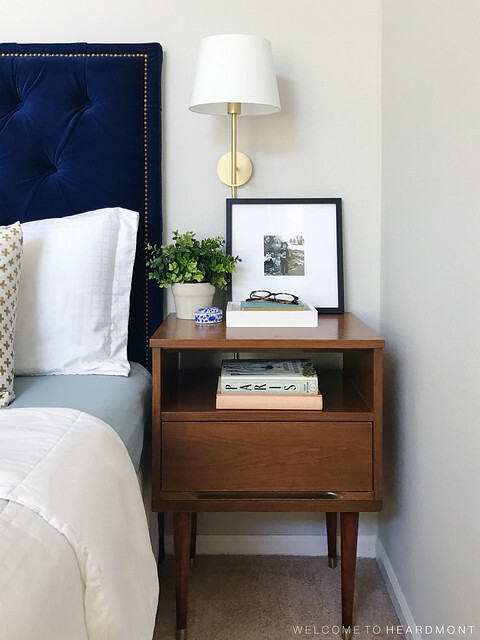 It’s amazing how much better we feel, living in a construction zone, with fresh linens and pretty nightstands. I wrote about our DIY headboard here and painting the walls here. I brought up a photo from our wedding for Stephen’s nightstand. It’s hard to believe we’ll be celebrating 9 years this November! We installed the sconces from IKEA awhile back after a quick coat of gold spray paint. The nightstand is a new addition to the room. I came across it at an antique mall a few months ago for NINE DOLLARS! I couldn’t believe the price, but you’d better believe I hauled that bad boy up to the register and paid before anyone could question it. 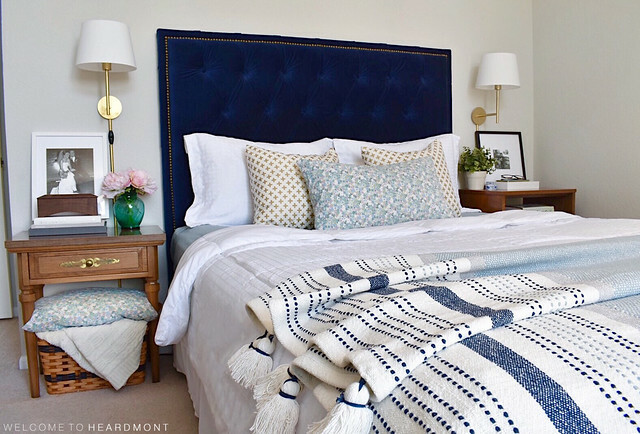 The tassel throw at the end of the bed was a Mother’s Day gift to myself. 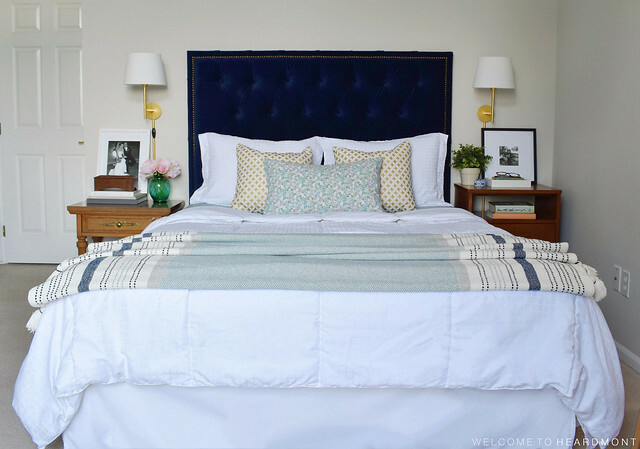 It really inspired the color scheme of the bed with the aqua sheets and blue floral accent pillows. 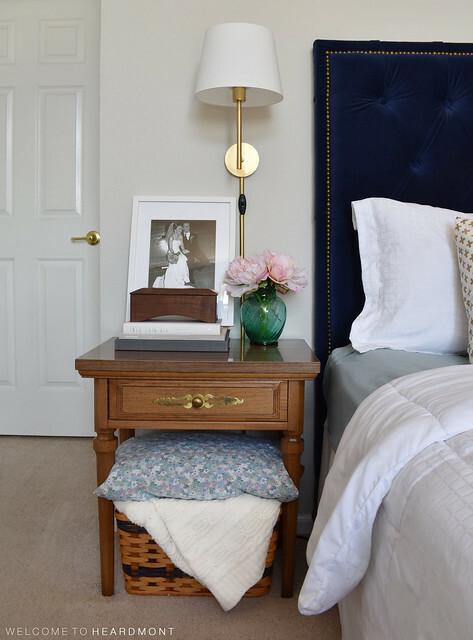 One thing I love about both nightstands? They have drawers! It is so much easier to keep the top surface clean when there’s a drawer for all those nighttime odds and ends. About six months ago, I finally admitted it was time to get glasses for nighttime reading and TV watching. I absolutely love these I found online at Warby Parker (not an ad). I write in that little blue book every night. It’s a Line A Day journal and is an amazing way to record the day’s highlights, funny things the girls said, and milestones without feeling obligated to write for an hour every night. I highly recommend this little book to other moms who want to record memories but don’t think they have time to keep a journal! So that’s a little tour of our spruced-up bed area. 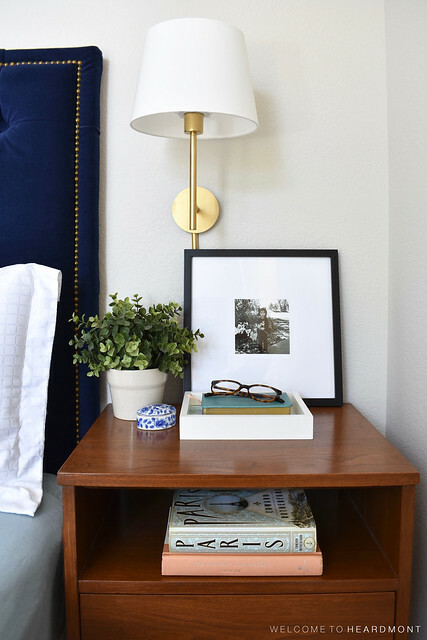 Having nightstands with storage has really made this area more functional, and it doesn’t hurt to have pretty new linens to snuggle. Before you go, do you want to see a before photo? You know you do! Here’s what this room looked like when we bought our house! 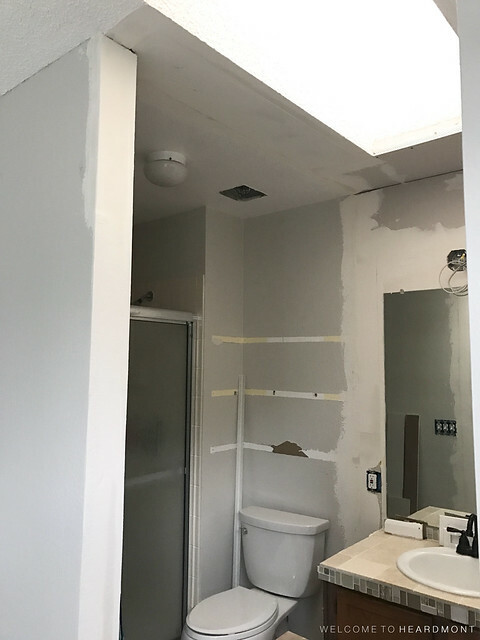 We’re almost done with the drywall in the master bathroom. It’s taken a lot longer than I expected. 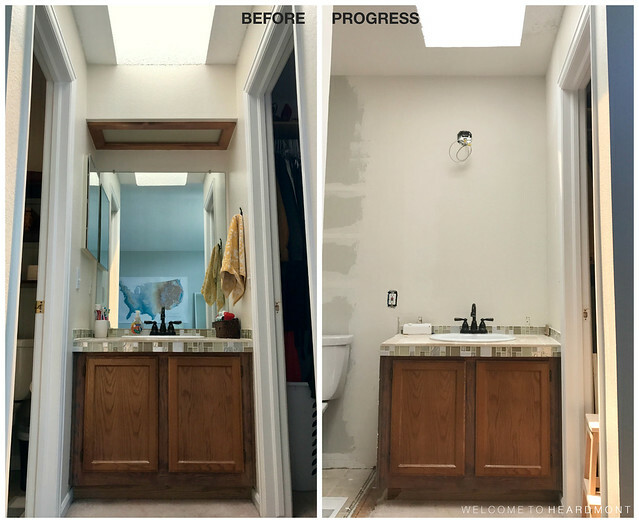 I have so much more respect now for DIYers who participate in the One Room Challenge and completely finish entire room renovations in 6 weeks! 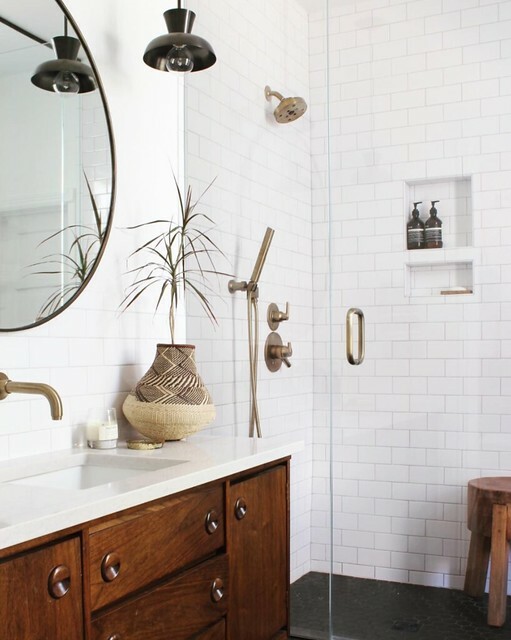 Last time I showed you the master bathroom, it looked something like this. We’d just finished patching all the holes in the drywall from taking out the wall and taped up all the seams. 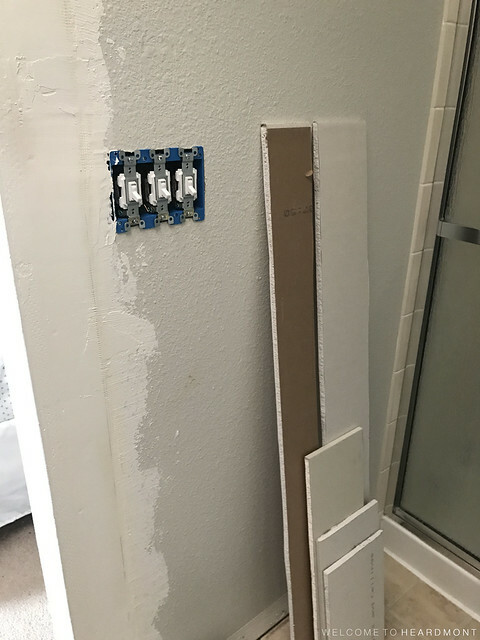 After watching a few tutorials on how to install and patch drywall (this one and this one from Lowe’s were the most helpful), I got to work mudding. This was my very first time using joint compound or doing anything on a larger scale than a small patch, so it was a learning experience for sure. Here’s what I used. pre-mixed joint compound – I used 2 of the 3.5 quart tubs of this stuff before getting smart and just buying a 5 gallon bucket! After the first coat, here’s how things were looking. 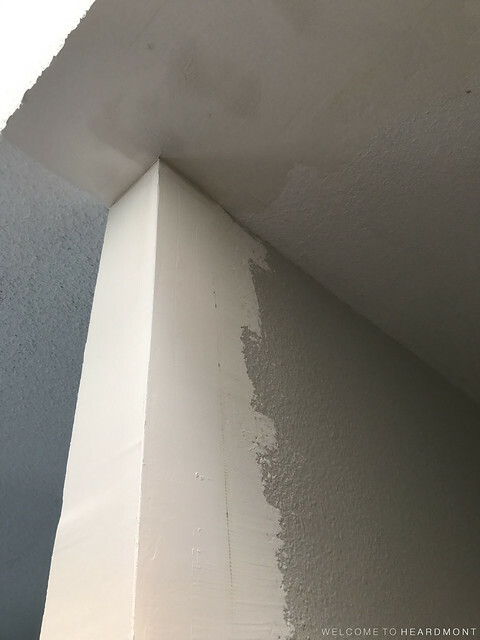 I learned that the vinyl outside corner bead I used on the new corners definitely did not work on inside corners or on certain outside corners where there was no wood behind the drywall. So I had to find another solution (paper tape) for those! You can see below where I still needed to add tape to the inside corners at the top edge of the new entrance to the room. The first coat was definitely rough and took awhile to apply, but it made such a difference in the feel of the room. The walls felt more and more permanent as I went. … but it was very obviously drooping along one edge that evening. I thought I’d have to remove the patch and start over (huge hit to the moral right there! ), but then Stephen suggested we add screws diagonally from the “loose” edge of the patch into the beam beside it. Four screws did the trick! Above the sink, the first coat was looking pretty good. 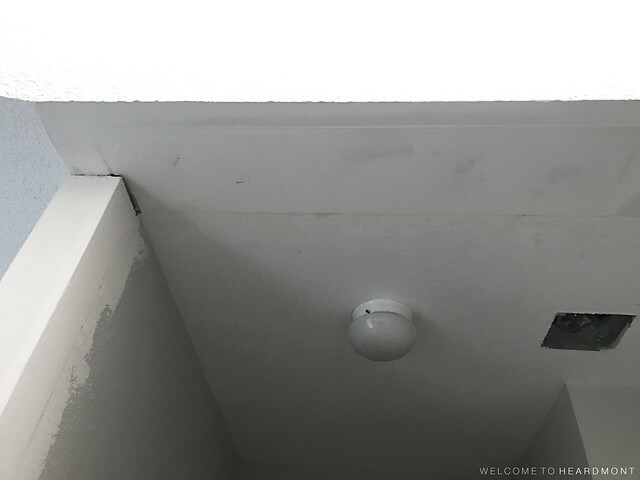 I wasn’t sure how to approach the inside corners without paper tape – problem solved when I picked some up the next day. 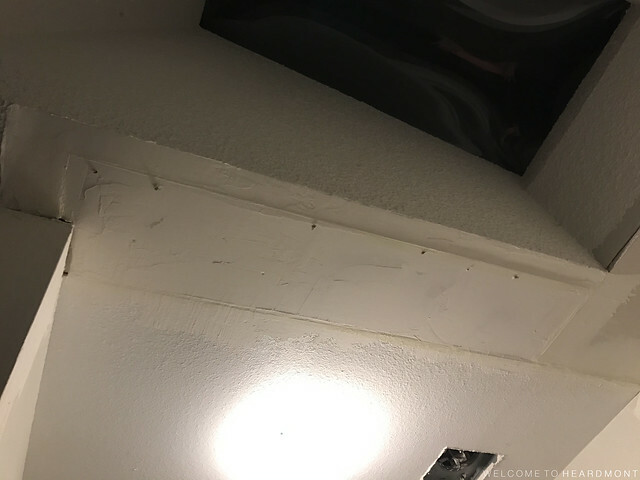 The vinyl corner bead along the edge of the skylight was never very secure, so it got ditched in favor of new tape before the next coat. 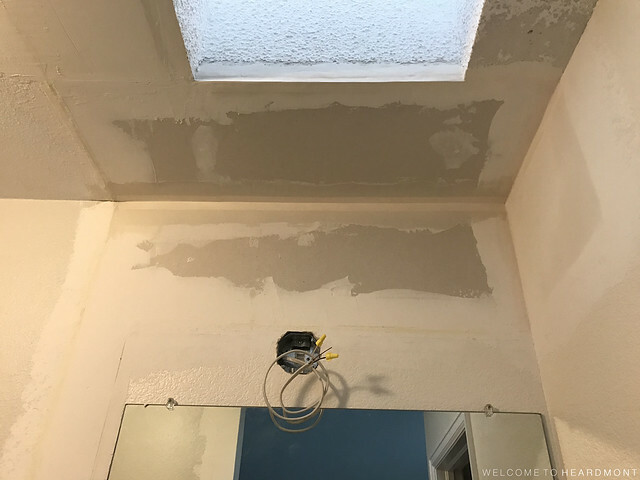 This area along the edge of the mirror was hard to tackle with the mirror in place, but the nice thing about the first coat of plaster is that it can be really rough. We tried to leave the mirror up for as long as possible so we could still have a fully functional bathroom. Before the next coat, I used my taping knife to knock down all the rough ridges left in the mud from the first coat. I read that this helps the second coat go on more smoothly because there’s less chance of chunks of plaster breaking off and streaking through the next coat. On the second coat, I mostly focused on taping the inside corners with paper tape and that troublesome drooping ceiling patch. Here’s a super close-up look at the top of the new entrance wall with the inside corner tape in place. 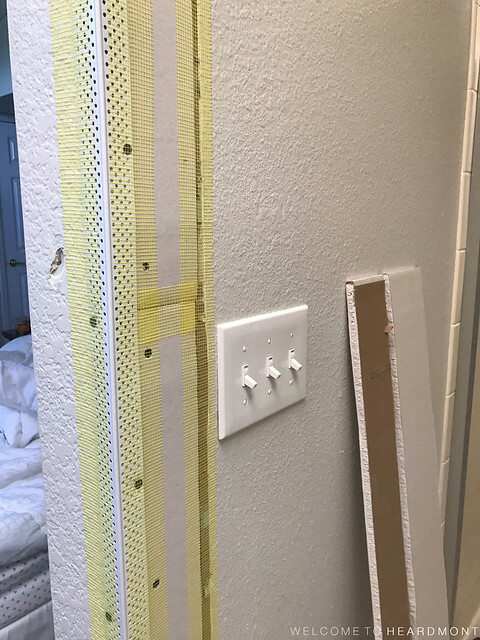 In case you didn’t know how to apply paper tape to drywall seams (I didn’t! 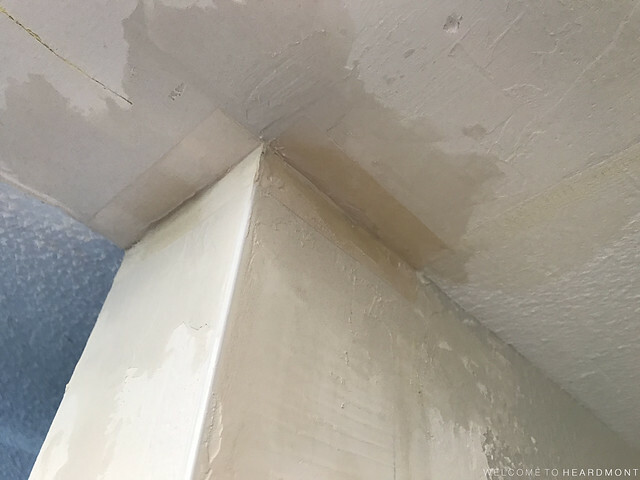 ), you put joint compound on both sides of the drywall under the tape, place dampened tape over the joint compound, and use your joint knife to smooth the tape and squeeze the plaster out the edges. Once the corners had dried a bit, it looked more like this. 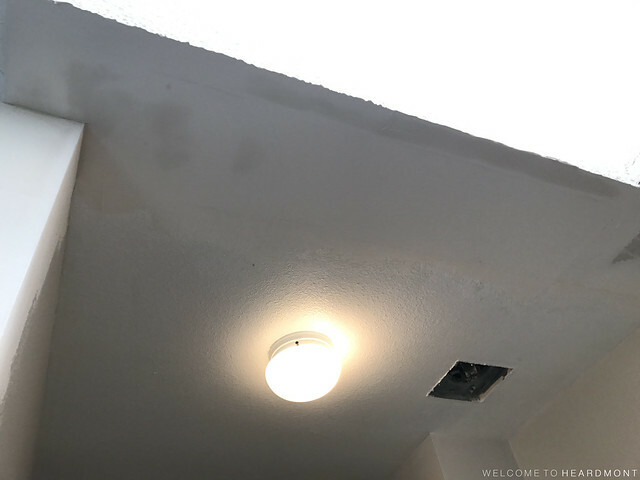 After the second coat, the ceiling patch was looking much better. We weren’t going to have to replace it – whew! 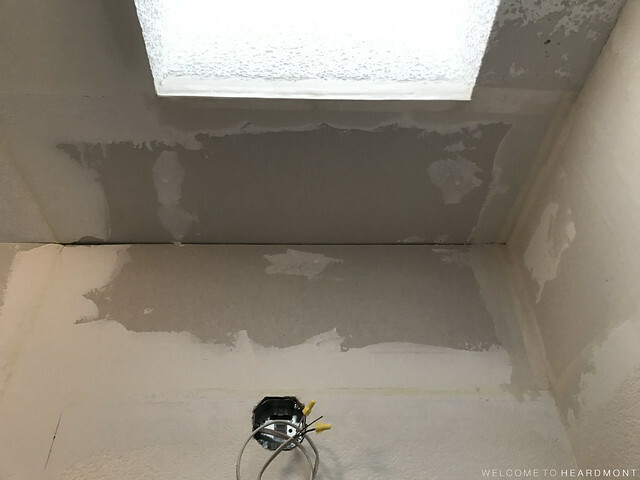 I added tape to the edge of the skylight and the inside corner of the walls then came back to add tape to the long wall above the sink later. It’s so hard to wait 24 hours to let everything dry before adding another coat! The left edge of the horizontal seam below gave me more trouble than I expected. 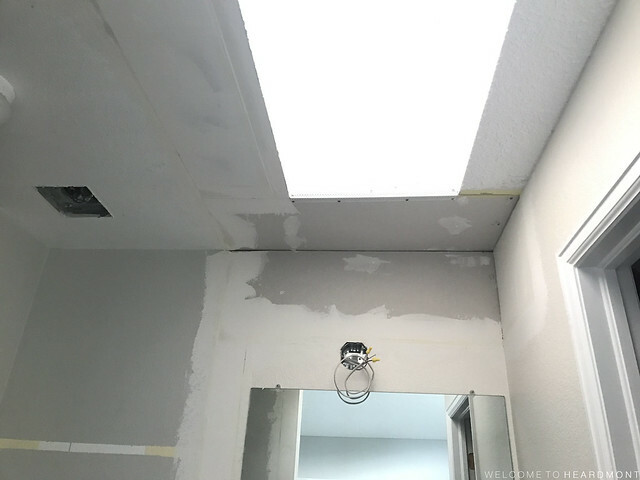 The edges of the ceiling and wall patches meeting in the same corner made it really tricky to get a smooth seam. By that evening, the second coat was done. 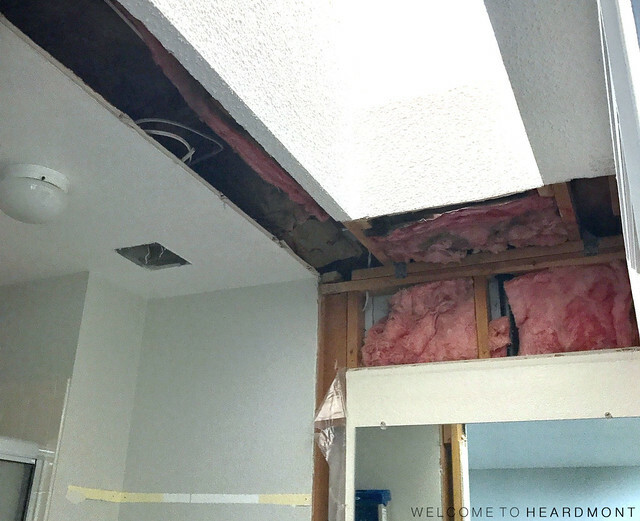 I went ahead and lightly coated the damaged areas above the toilet where our floating shelves had been. For the third coat, I used a 10″ knife instead of the 6″ knife to apply a wide, feathered coat over all the seams. After another 24 hours of dry time, here’s how the bathroom looks now! I am in love! It’s amazing how smooth the walls look and how hard it is to tell where the patches were added under all that mud. 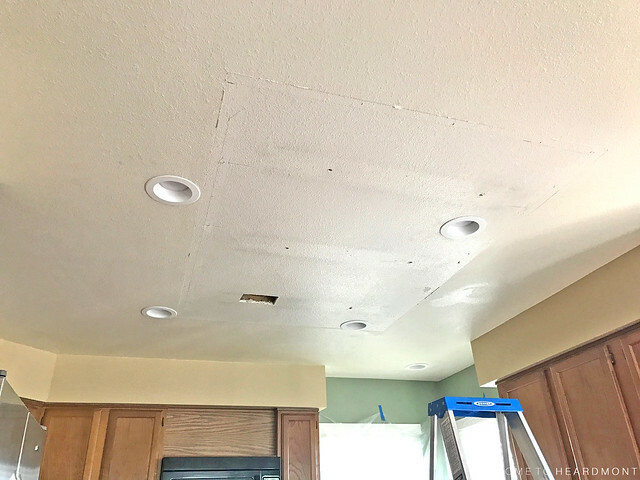 That troublesome ceiling patch is almost completely flat now. It’s hard to tell there was ever a dumb fluorescent light box above the sink. I’m super proud of these corners. And look! 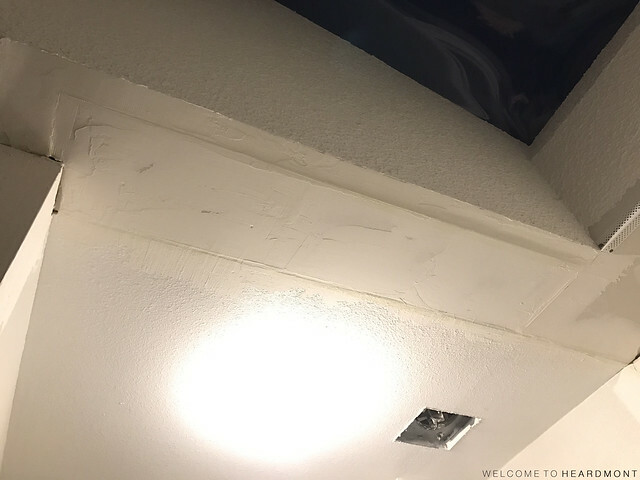 Now you can barely tell where those ceiling and wall patches meet (at the left side of this seam). I’m so excited to swap out the vanity and add our new lighting to this wall. Can you picture it? Here’s a view you haven’t even seen until now – you can actually see our whole shower! I love how open everything feels in here, but of course now we realize how much of an eyesore the shower really is. There’s no hiding this puppy, so stay tuned to see how we decide to tackle this area. The ceiling feels about 5 feet higher now. 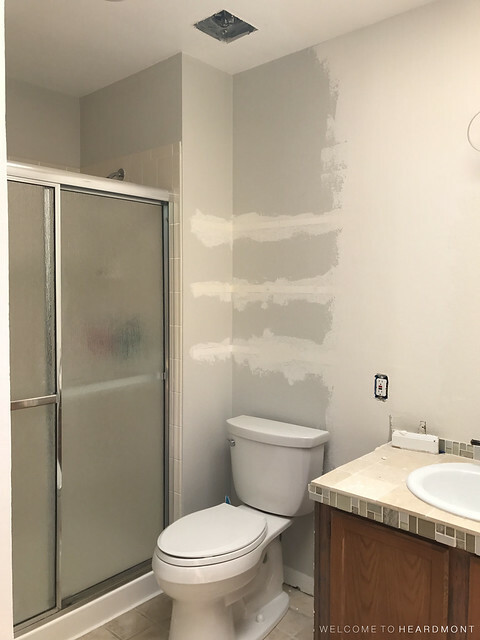 One of my favorite parts of renovating is being able to compare before and after photos. If you enjoy them too, here are a few to show our progress so far! I love how the dried mud gives a great preview of how white walls will look in the space. So fresh and clean! This process took a lot longer than I expected! I’m really happy with how the walls are turning out, but I think I have a bit more to do. 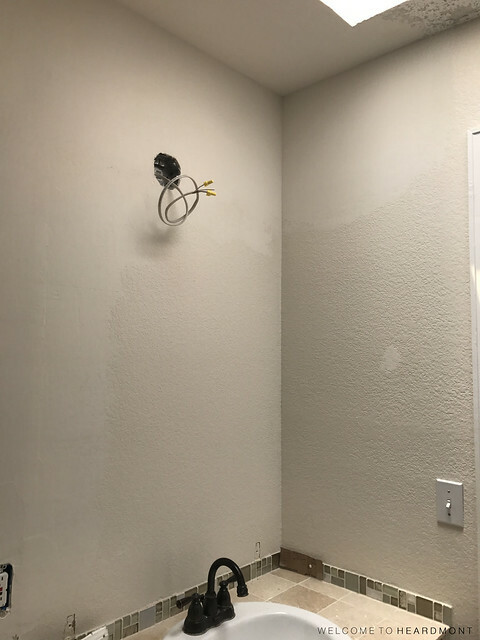 I’m considering doing a skim coat on all the walls because I just don’t think I’ll be able to match the current texture exactly on such a large area. That coat won’t happen until the vanity is removed though, so it looks like we have more demo in our near future! 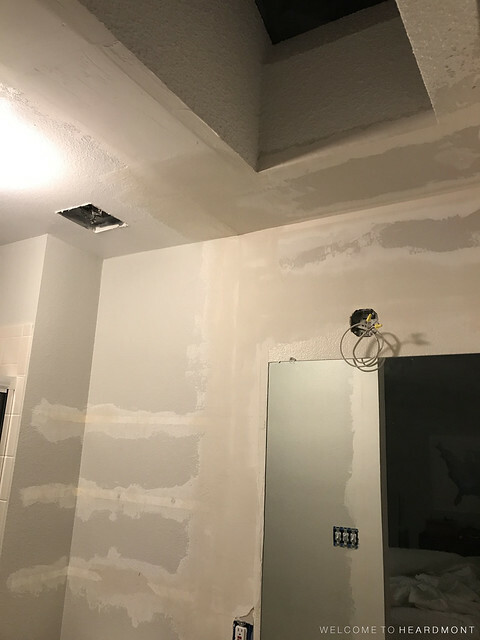 Have you ever done drywall patching and plastering on a large scale before? How did it go? 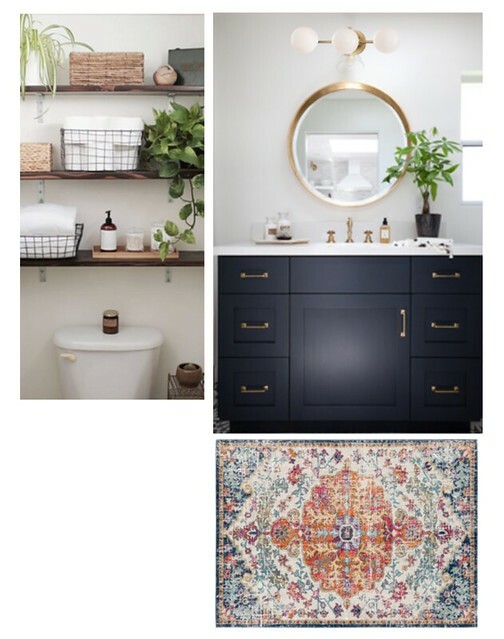 Check out our previous master bathroom posts below! 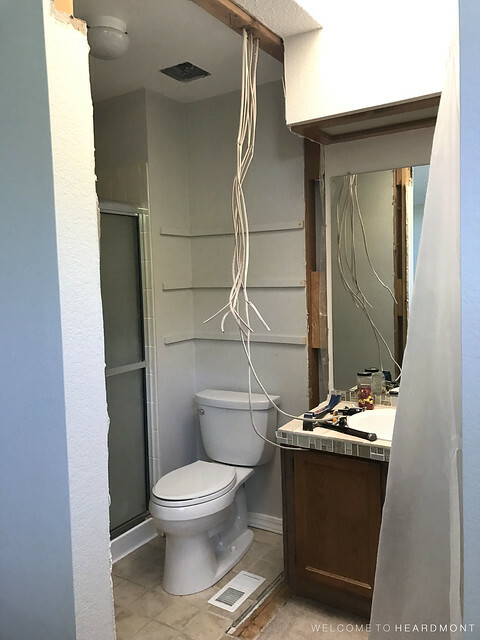 Progress is slow but steady in our bathroom! I’ve started plastering the joints and realized this process will take awhile. More on that later, today pretty pictures! Today I have some inspiration photos to share AND I’d love to get your opinions! 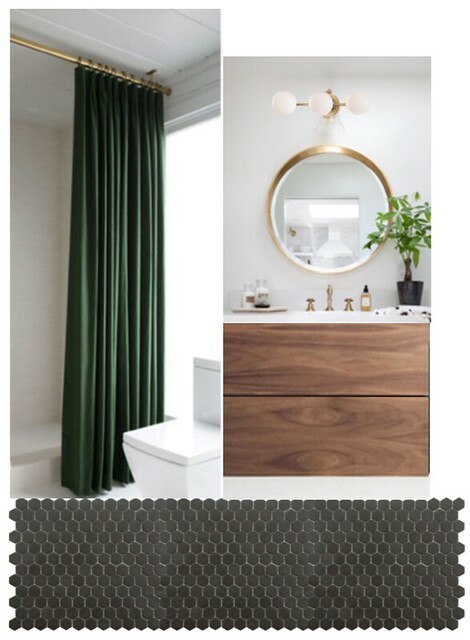 First, I wanted to talk about the finishes we’ve already chosen for our master bathroom. 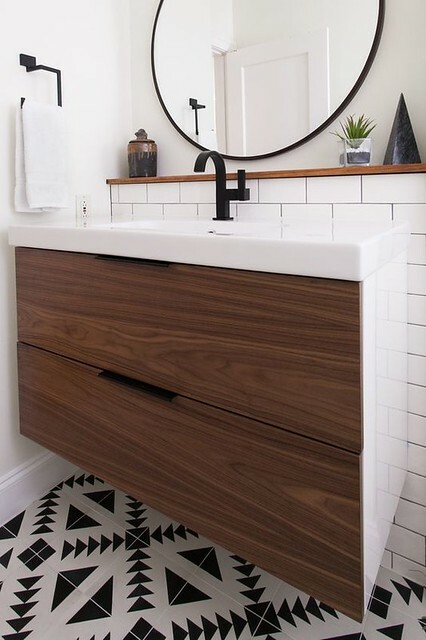 We’re planning an Ikea hack for our vanity, and it should look almost exactly like this when we’re done with it – floating, wood-faced with black pulls and a white countertop. The walls will be white, and I’ve already purchased this mirror from Target for above the sink. 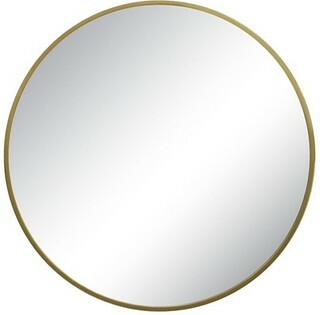 I love the shape and color (it’s a warmer gold in person) and the price can’t be beat for a mirror this size! 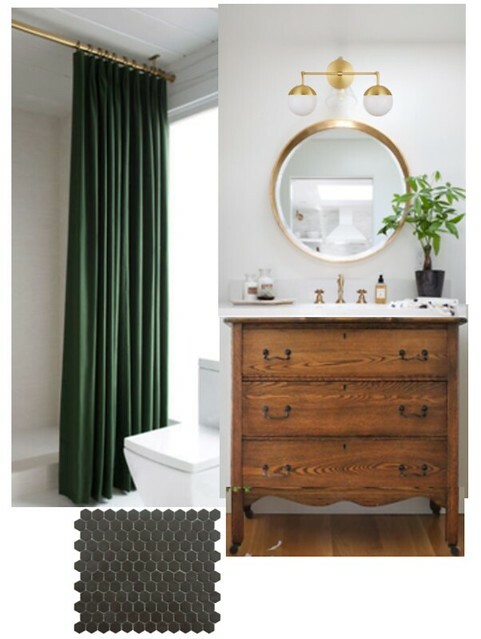 Here are a few images I’ve saved from Pinterest that show the look we’re going for. 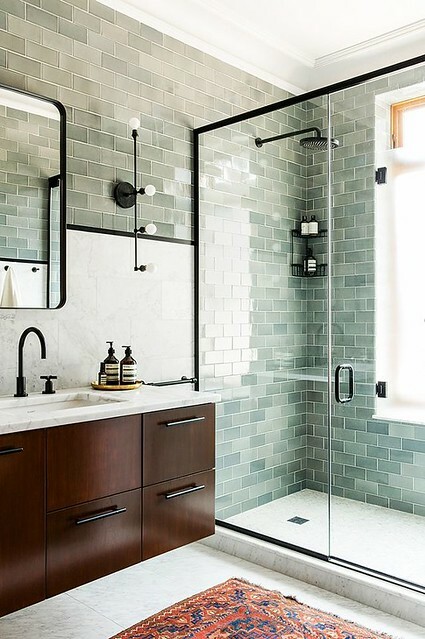 The main decisions that need to be made are 1. light fixture color and style, 2. faucet color and style, and 3. floor color and style. 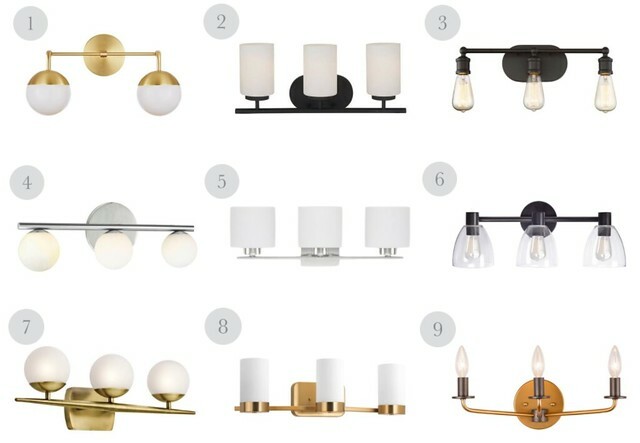 I love gold and black together and don’t think I want all one color fixtures in our bathroom, but I just can’t decide how to mix them. 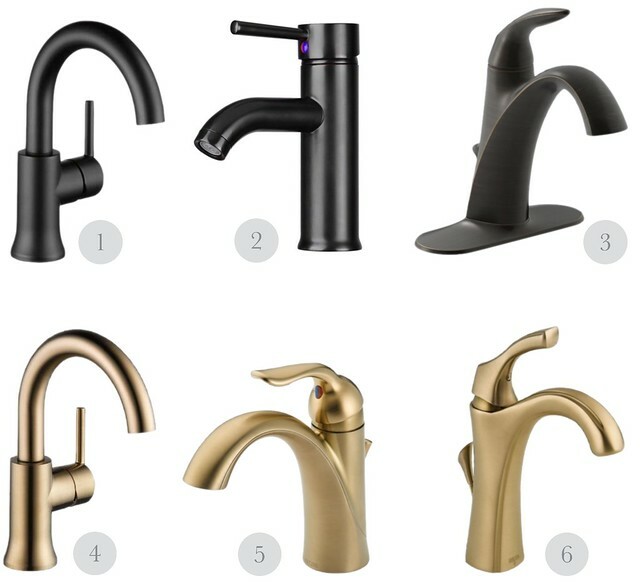 Here is a round-up of potential faucets and light fixtures. Help me choose! Just a note on the light fixtures below, I would most likely spray paint one of the silver fixtures gold or black if it was the winner! What do you think? What would you choose? 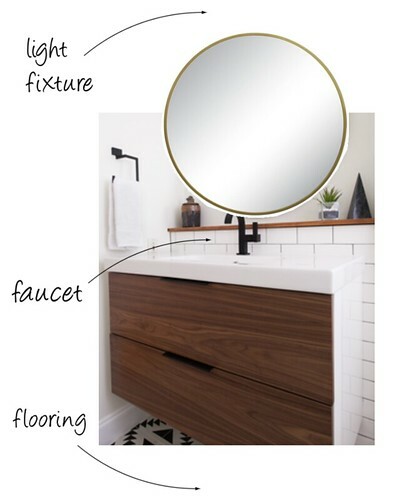 Tell me which faucet and light fixture you think goes best with our vanity and mirror choices, and would you do a light or dark (or patterned) floor? Hi y’all! I hope you are having a great end of your week. 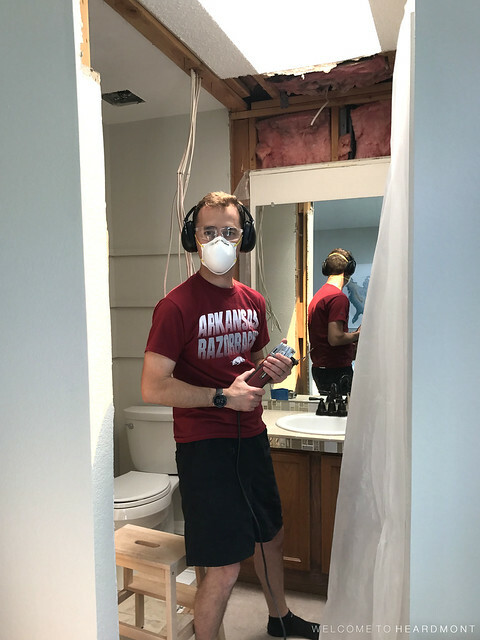 We spent the 4th with family and then took some time to visit friends, but I’m so ready to jump back in and knock out this bathroom remodel of ours! Time to share how this little room is progressing. 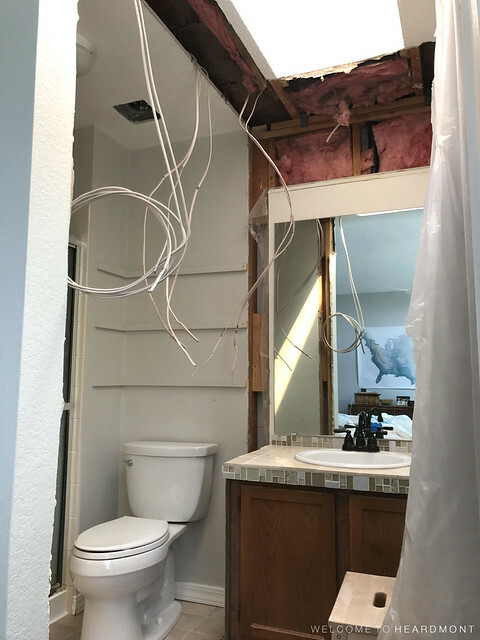 Last you saw our master bathroom, it looked like this. 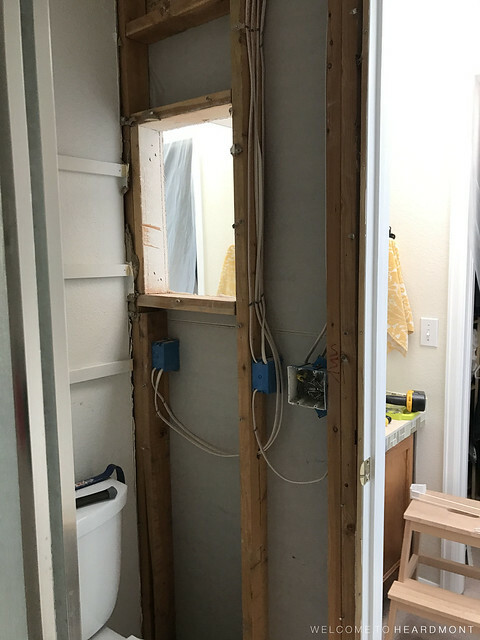 The wall between the vanity and toilet was outta there, but it was time to address those dangling wires and all the holes in the drywall left by the wall and fluorescent light box. We started with the wiring. This is the topmost room in our house, so the ceiling follows our roofline. 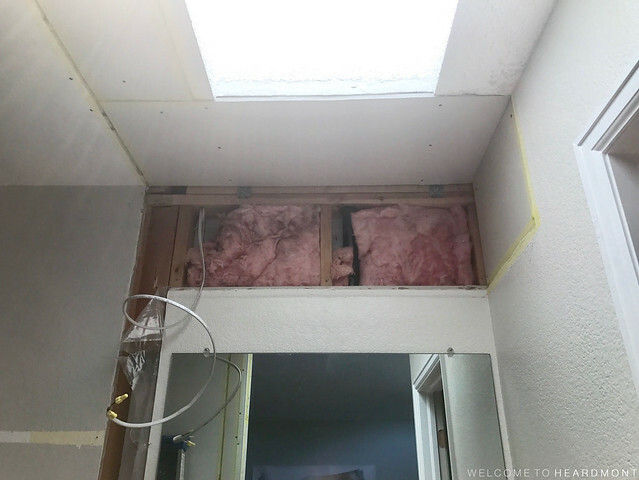 Needless to say, there is no attic access above this bathroom to run electrical, so we had to do it all from inside the room. 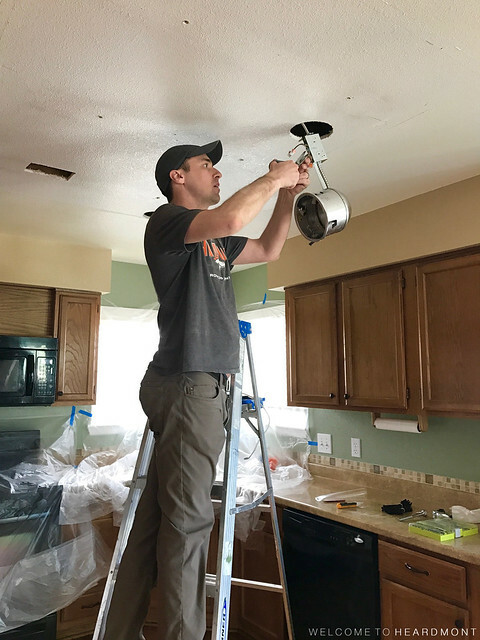 Stephen was able to fully replace the wiring to the light fixtures and add junction boxes for the other wires that wouldn’t reach their new homes. The junction boxes were secured to the ceiling beams and safely covered. Once all the wiring was done (a task that took a lot longer to do than to write about – ha! ), the ceiling looked pretty much like this. 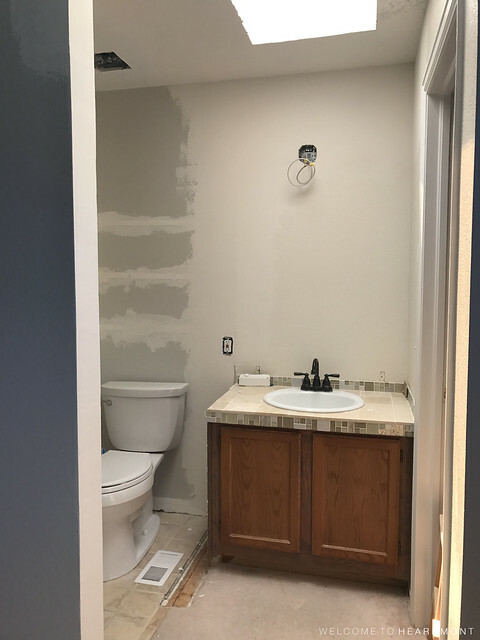 I snapped these pics a little later in the process, but you can see we placed all three light switches on the wall across from the toilet (they operate the vanity light, ceiling light, and exhaust fan). 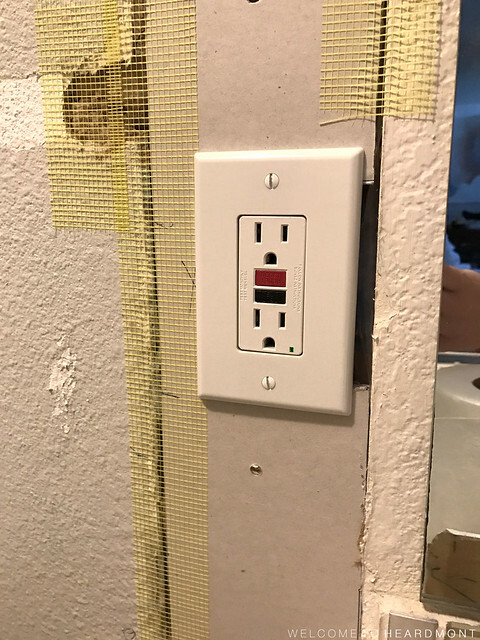 And we added the GFCI outlet on the wall beside the vanity for easy access. There’s just something about new light switches and outlets that makes me so happy! They’re so clean and fresh – no crusty paint or dust on anything! After the electrical, I took over and started fixing what we destroyed during demo. 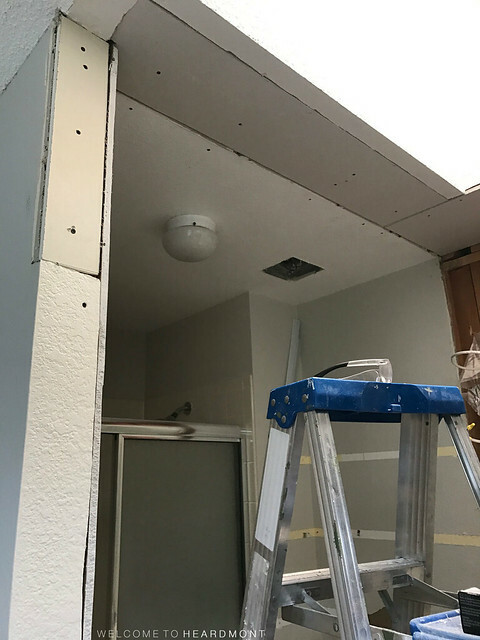 We purchased one sheet of 1/2″ drywall (our walls and ceiling are the same thickness). Stephen actually had the associate at Home Depot cut the drywall into three sections at the store so it would fit in his SUV. I ended up using only 2/3 of the 4′ x 8′ sheet. 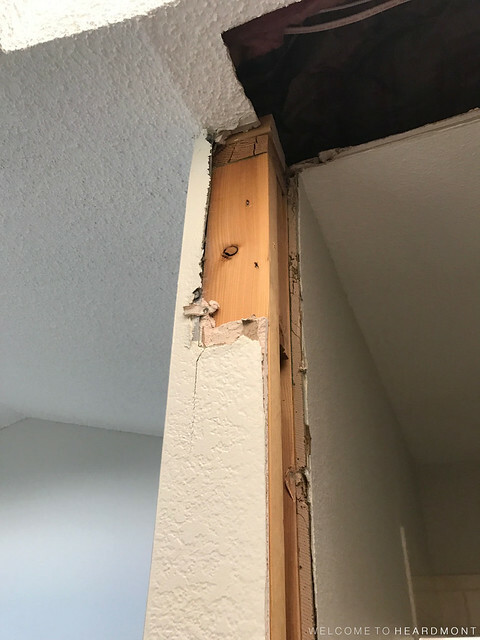 We were super careful not to damage or take down more drywall than we needed to during the wall removal, but this corner suffered when we pulled the beam out of the ceiling. 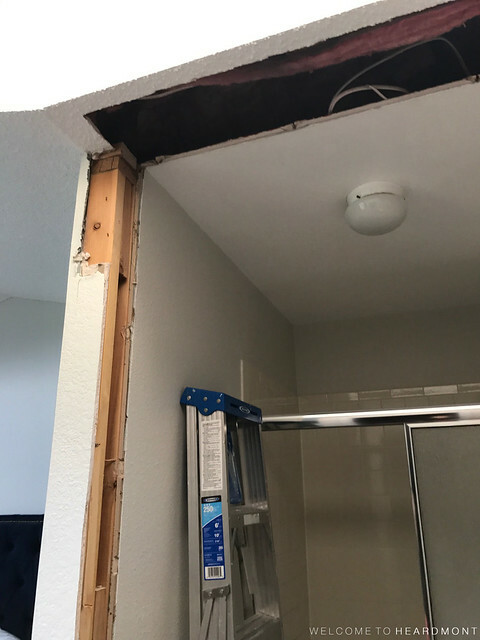 And, of course, there were all the other holes in the drywall that we knew we’d need to repair. 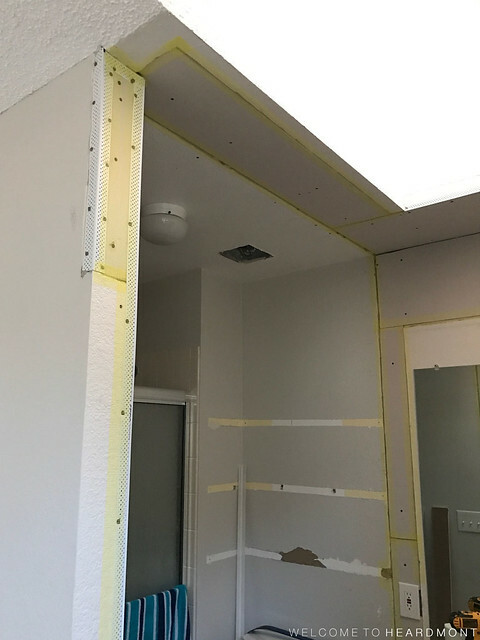 I started by removing the metal corner trim that was damaged on the bedroom side of this wall and adding a small drywall patch at the top. Then I added a long patch on the other side of this corner. The strip of drywall missing from the ceiling in the photo below was a tough patch to figure out because there were no beams to secure it to. Instead I added four braces (three pictured below) to the back of the existing drywall which to secure the new patch. After the large patches were in place, I nailed on the outside corner bead. 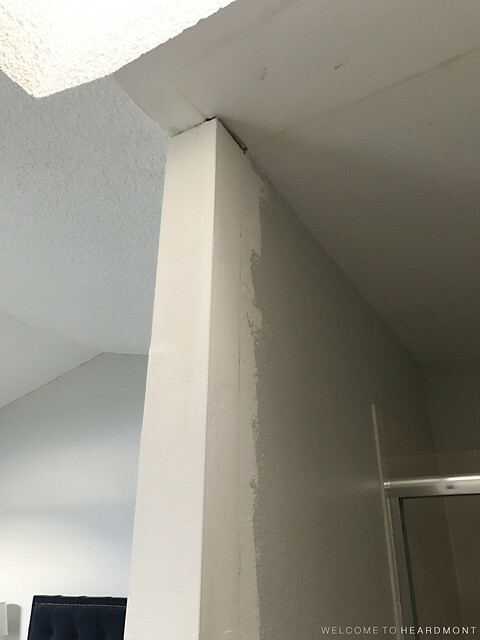 Corner bead is amazing because it makes outside corners (where two pieces of drywall meet) look perfect, even if they are far from it. Instead of metal I chose vinyl corner bead. Although metal is the product of choice for large projects, I found it so hard to cut that I needed an easier option. This vinyl corner bead is recommended for damp locations and was so much easier to cut to size than the metal stuff! I used these cupped drywall nails to secure it. Next came the taping. I used this yellow tape which was super easy to apply! 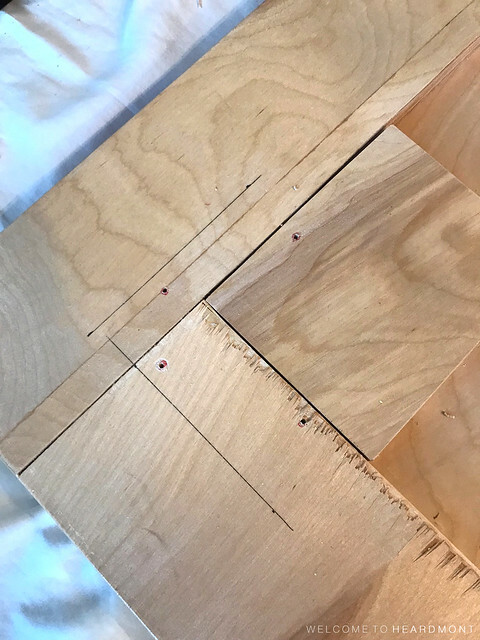 The pros recommend taping over every seam and piece of corner bead before applying joint compound. This mesh yellow stuff makes it easy to see the joints and to tell how evenly you’re applying the joint compound. 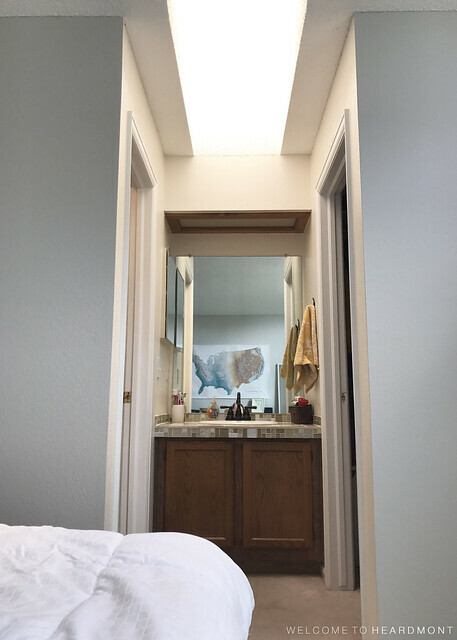 We tackled the area above the sink last because I had to measure and install the junction box for our new vanity light. 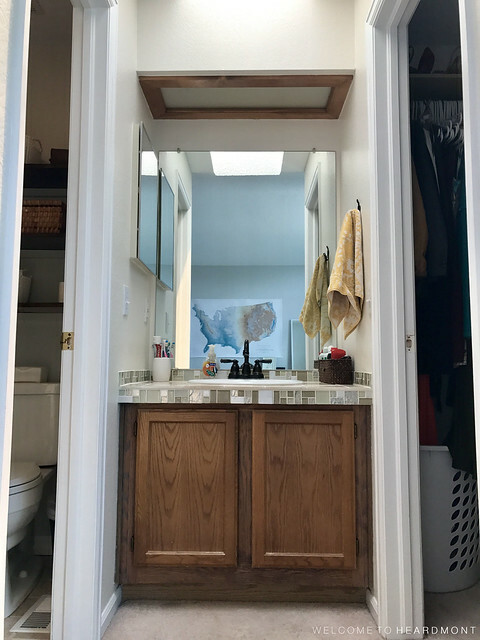 Our new vanity is wider than our old one, so the placement of this box might look off-center, but it should be perfectly centered over our new sink. 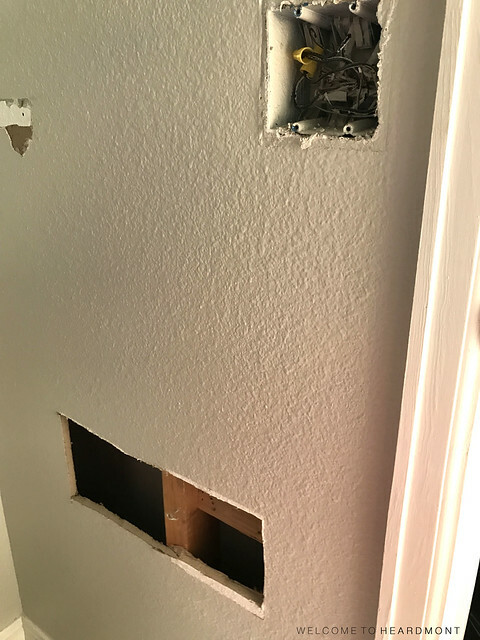 I was able to conveniently install our junction box right beside a stud, but many home improvement stores also sell these 1/2″ deep pancake boxes specifically for installation over a stud. How cool is that? No more off-center lights! 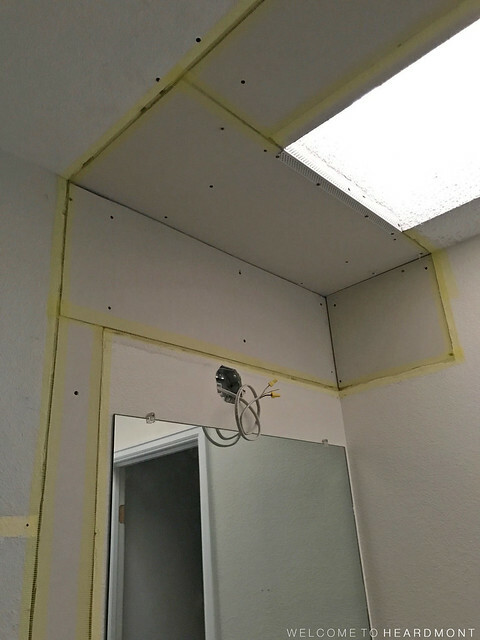 So that’s pretty much how our bathroom is looking with the drywall patches, outside corner bead, and tape in place. I still need to pick up some inside corner tape for the area above the vanity and probably more joint compound. I have a feeling this little room is going to take a lot of mud to smooth it out! 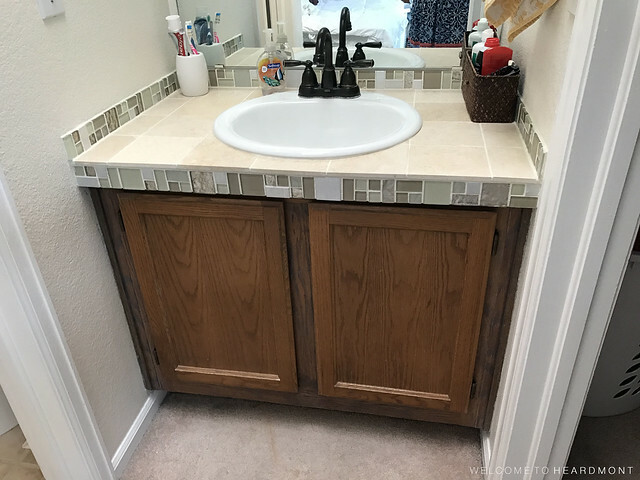 If you missed any of our previous bathroom posts, check them out below. Thanks for visiting! 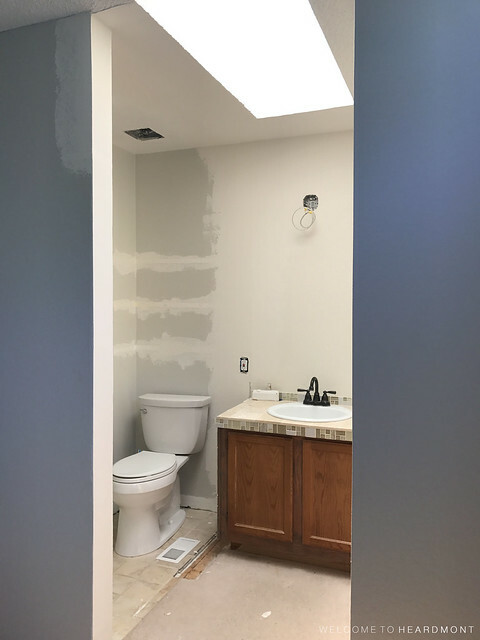 Last time we chatted, I shared that we were about to start on our master bathroom renovation. At the time, we weren’t quite sure how much of a project we’d be taking on, but we knew this room needed some changes. Would they be simple cosmetic upgrades or something bigger? 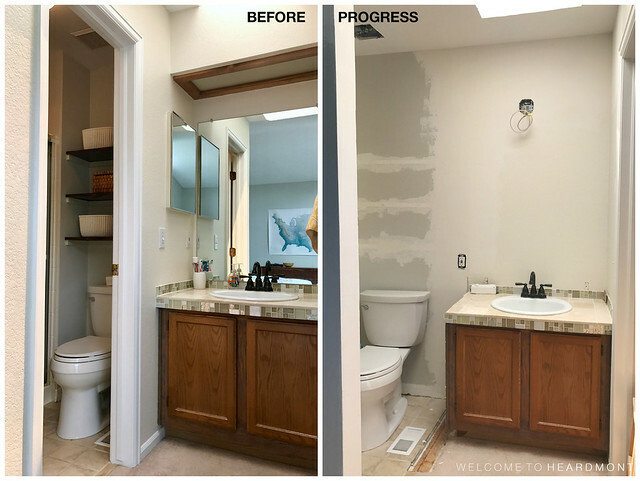 We mentioned that we were considering removing the wall between the vanity and toilet, and most of you here on the blog, on Facebook, and on Instagram said to go for it! With nervous grins on our faces, we got to work taking down. that. wall. This was no ordinary wall. It housed three light switches and one GFCI outlet, so we approached this more as a deconstruction project rather than a demolition derby. 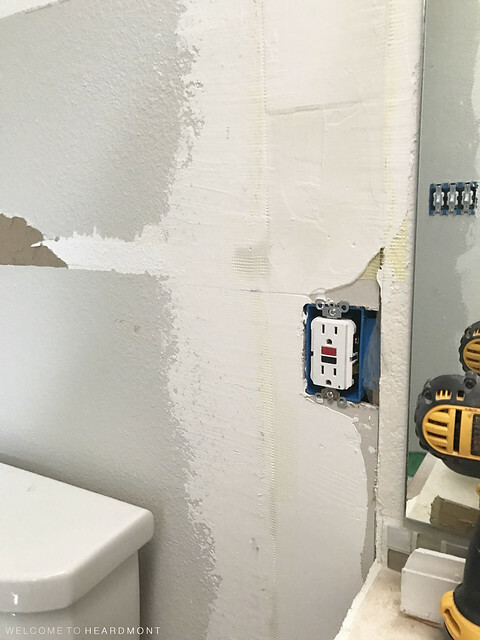 We started by turning off the breakers to the room and cutting out a chunk of drywall to determine where the electrical wires ran in the wall. 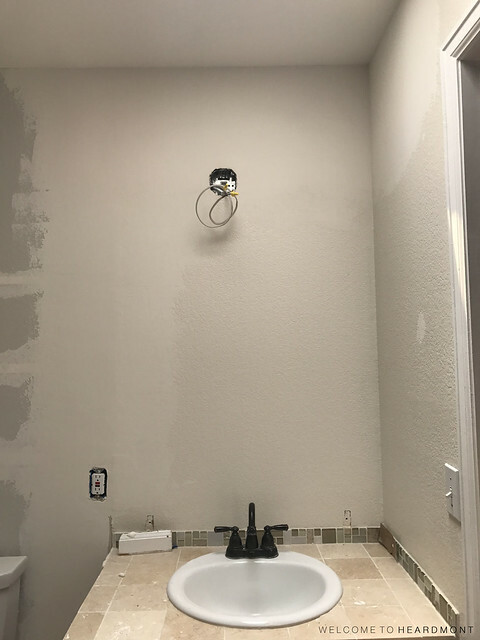 If you’re taking on a similar project, here’s a tip: Use your phone or camera with the flash on to take photos up into the wall to see wiring and other hazards. 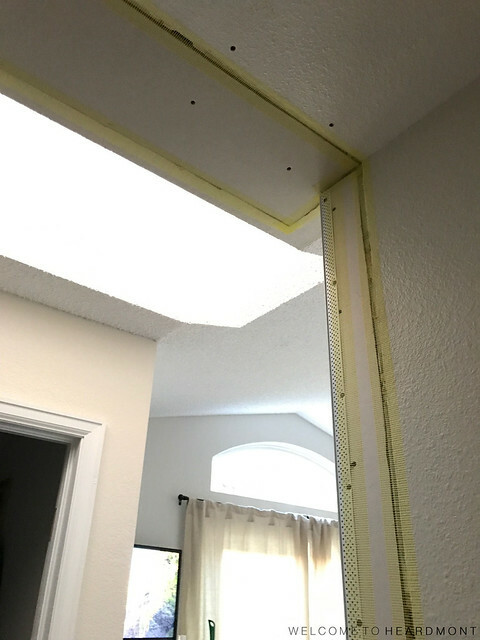 By doing this, we were able to see which portions of the drywall were safe to cut and which we should avoid. I’m not going to lie, with this project, Stephen was definitely in charge of the demo and electric work (I’m a good assistant!). The next steps (drywall, finishing, and “making it look pretty”) will be my responsibility. 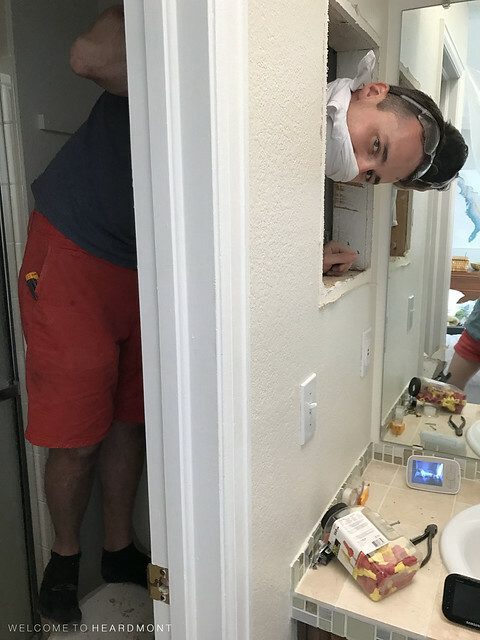 Here’s a shot after we took out the medicine cabinet and the back of the wall to show that we made it through! Here’s a look at the other side of the wall. We were definitely excited to see it coming down and starting to realize how much work rewiring all that electrical was going to be. Finally all the drywall was gone! At this point, the amount of light in the toilet/shower room was amazing! We knew we were making the right decision. 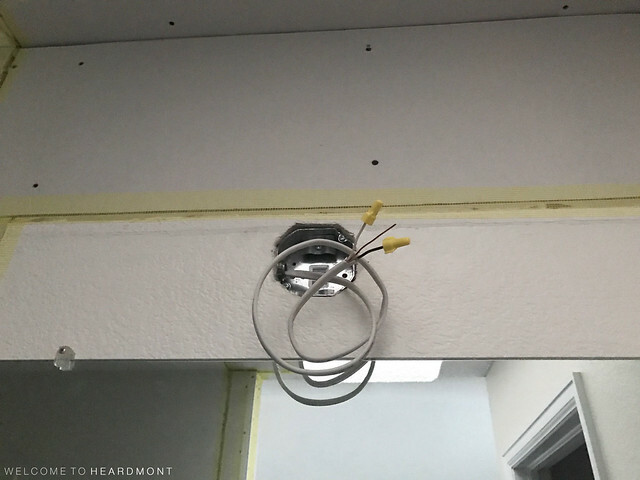 Once the drywall was down and before we could remove the studs, we had to move the wiring. Here’s another tip: Label your wires before you unhook them. You may think you’ll remember where every cable goes, but it’s easy to get confused once they’re all hanging from the ceiling. Just label them! With our wiring all labeled and out of the way, Stephen used a hand saw to cut the studs one at a time and pull them off the nails in the ceiling and floor. Can you even believe it?! No more wall! Stephen also took down that light box (the whole reason we started this project in the first place!) and then we hit a snag. 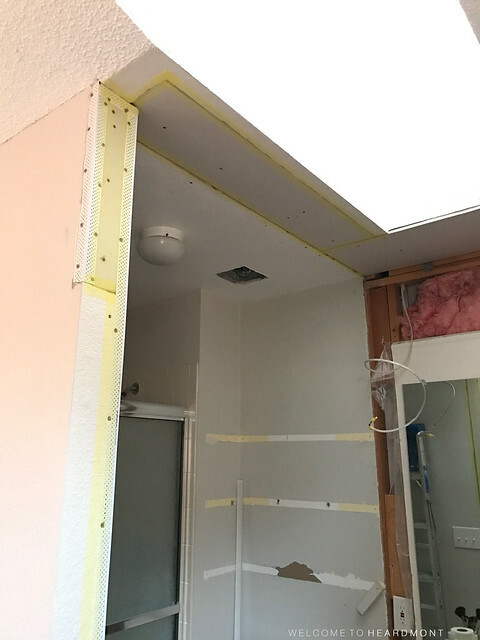 The beam in the ceiling at the top of the wall was not structural but had to be cut out because it was resting on the wall studs. Thanks to social media and generous friends (thanks Jenny and Jonathan! ), we were able to borrow an oscillating saw (like this one) to cut through the beam and pull it off the ceiling. After all that, the demo was finally done! 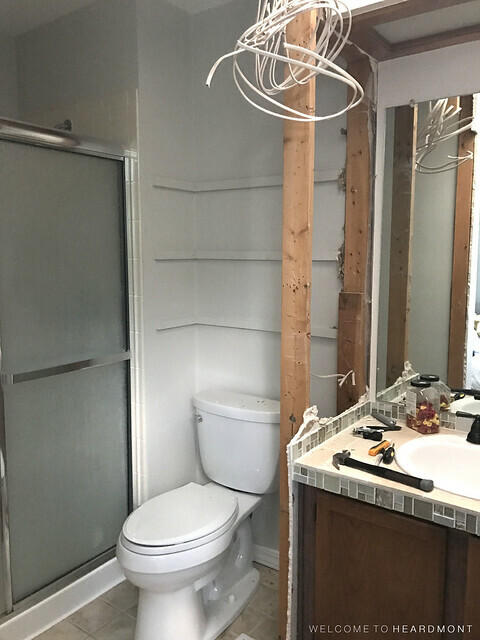 Even though the wall removal wasn’t the quickest project, it has made such a difference. We’re still using the bathroom because we left all the plumbing intact until we are ready to replace it, and we can actually both brush our teeth at the same time now! No more bumping elbows! Stay tuned for more progress. Next up, doing something with all those loose wires and fixing all those holes in our walls! What do you think of our progress so far? Want quicker updates on this project? I’ve been posting a lot of progress shots to my Instagram stories (on my Instagram page, click on the rainbow circle around my profile photo). 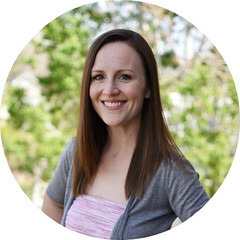 I’d love for you to follow along! 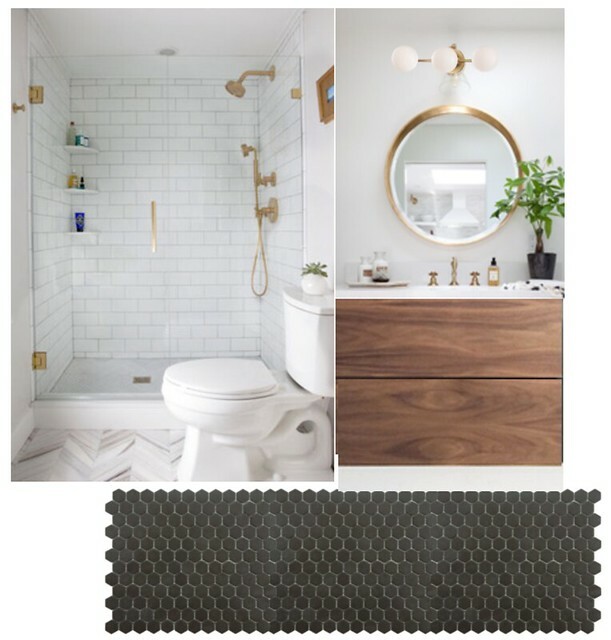 I’ve had a bathroom renovation on the brain for months now and I think we’re finally getting close to having a plan (and a few free weekends) to make it happen! 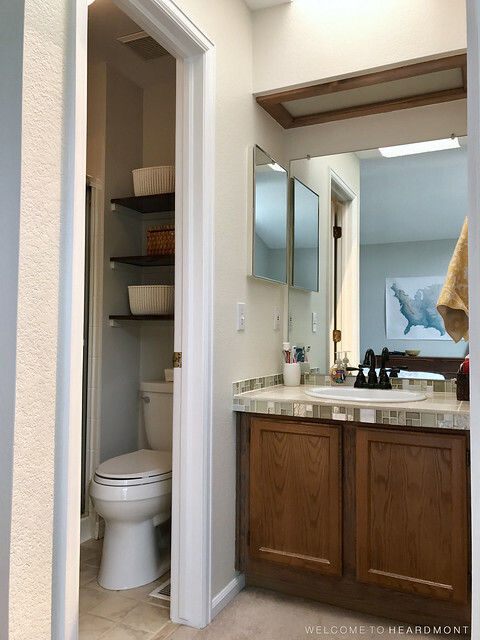 When we found our house two years ago, the size of the master bathroom and closet area were definitely a compromise we had to make in exchange for lots of other items on our checklist (nice yard, mountain views, good location, etc). 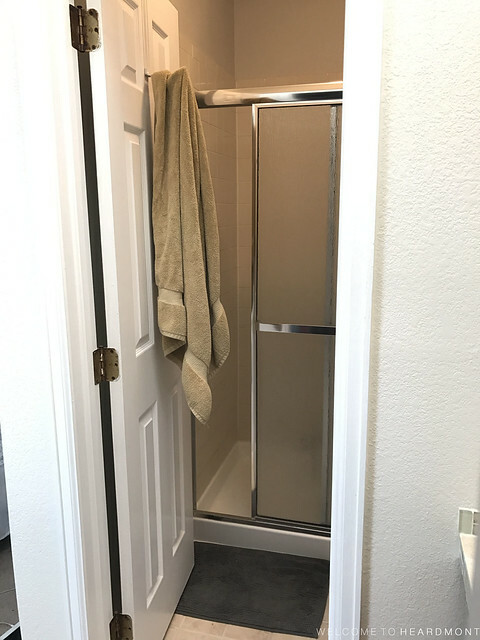 While I am grateful to have an attached master bathroom at all, ours is the size of a postage stamp and terribly designed. Here’s a look at what we’re working with and what we plan to change. … and the fluorescent light box above. 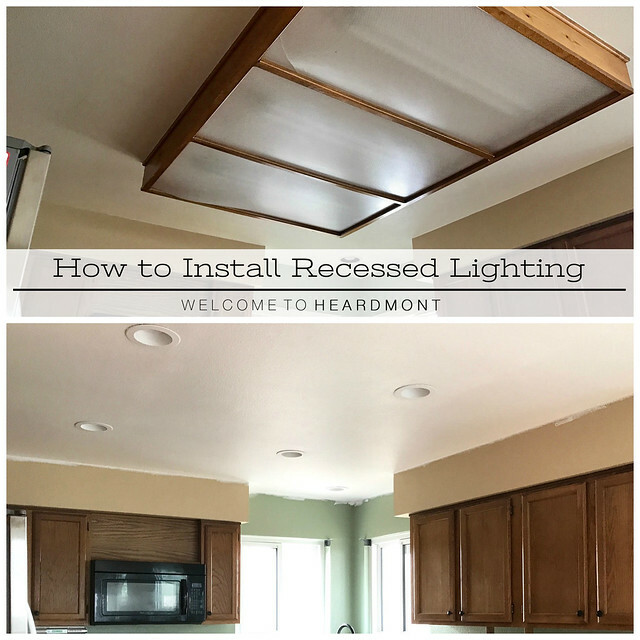 As you know, we are not fans of fluorescent lighting in this house (see how we took out the light box in our kitchen HERE), so this one will have to go. 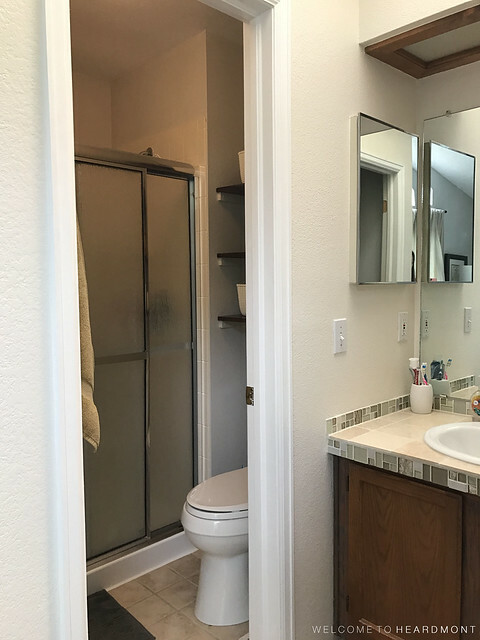 Another thing that makes this bathroom less than functional is the lack of elbow room. 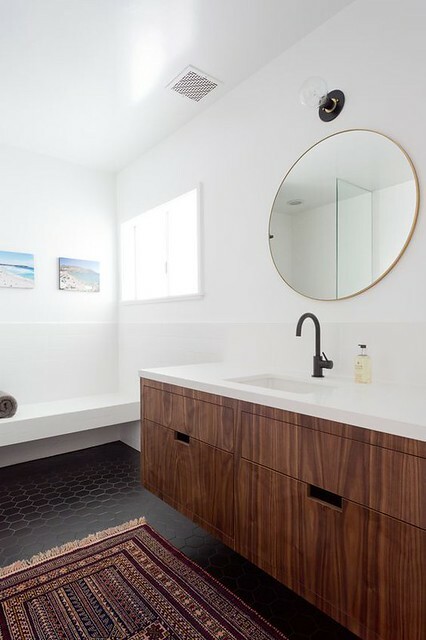 The vanity is barely 36″ wide, which basically means only one adult can use the sink area at a time. When we do try to get ready in the mornings or evenings at the same time, one of us always ends up halfway into the shower room while the other uses the sink and mirror. Continuing to look to the left into the shower room, you can see our little shower with chrome and frosted glass doors. Those things are a bear to keep clean. 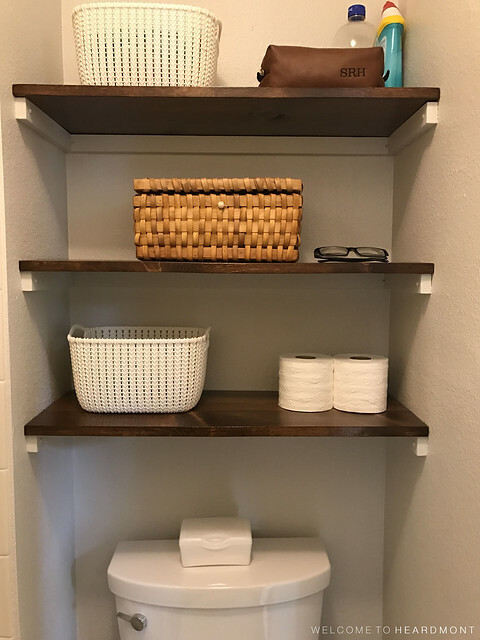 Because we had so little storage space in this bathroom, we added these stained wood shelves above the toilet about a year ago. These work really well for us and may stay in the room, depending on the rest of the design plan. The doorway to the toilet room is super narrow and made narrower by the towel hook on the back of the door. The room used to be white with a wide yellow stripe, but I painted it the same gray as our bedroom last year (Silver Drop by Behr) just to banish the yellow. When I painted, I removed a towel bar from behind the door. I always thought the towel bar would make more sense there if the door didn’t open into the room. Check out that flooring! 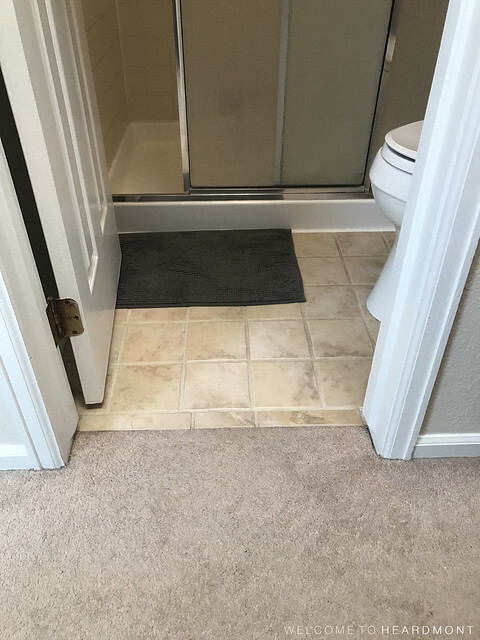 The tile and carpet combo is gross and has to go. When I was getting this photo ready to post, I thought to myself, “Sure, go ahead and watermark that one. Somebody is definitely going to want to steal that picture!” NOT. 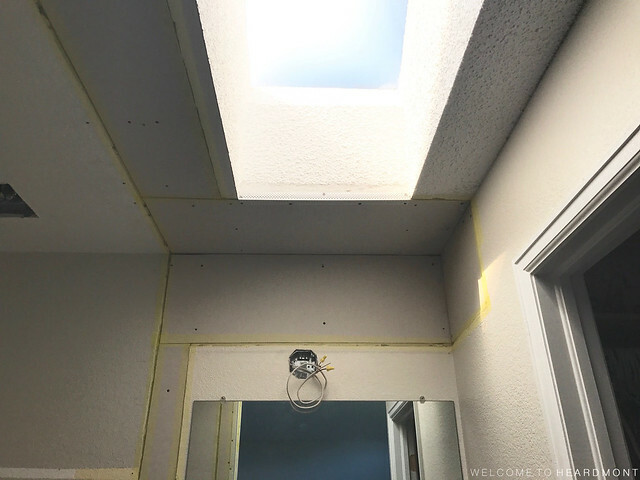 Backing up into our master bedroom, you can see the bathroom has a skylight. 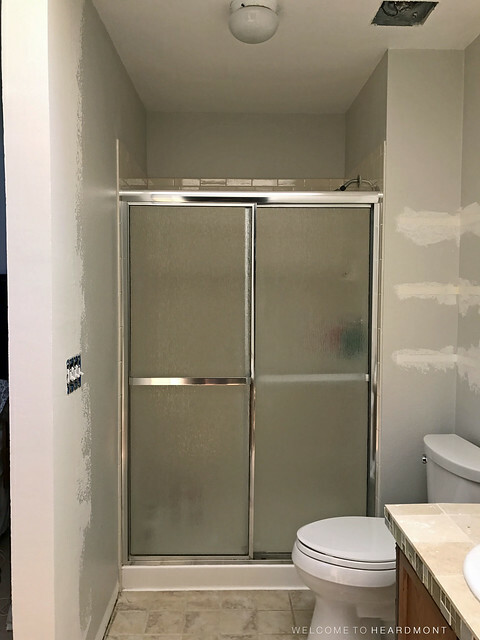 One of the possibilities we’ve discussed for this space is removing the wall between the vanity and shower rooms. 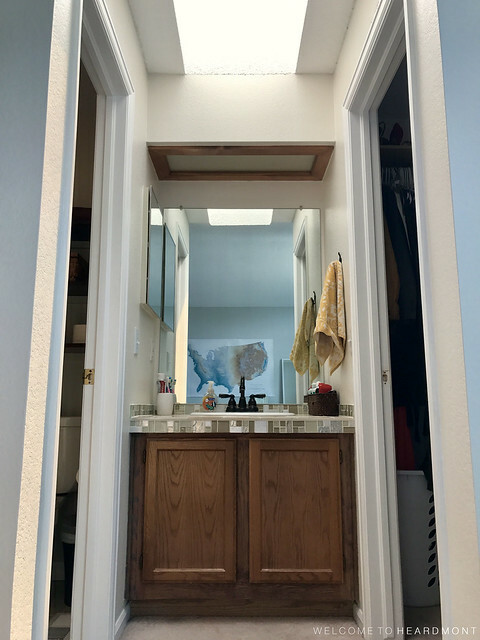 If we move forward with that plan, the new door would go across this entrance, closing the vanity off from the bedroom. 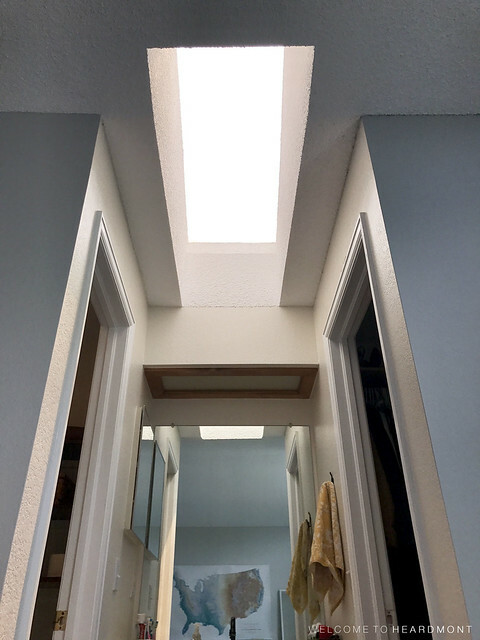 One item we’ll have to consider is that the skylight actually goes past that entrance wall into our bedroom ceiling by about 6-8″. This means that we won’t be able to do a traditional wall here with a pocket or regular door. We’re already brainstorming creative solutions for this doorway. When I think about our house as a whole, this single room suffers most from poor design and lack of storage. What kills me is that about 1 in 5 homes in our neighborhood have this exact floor plan! Can you believe that? Now that you’ve gotten the tour and heard our issues with the space, here are our options. 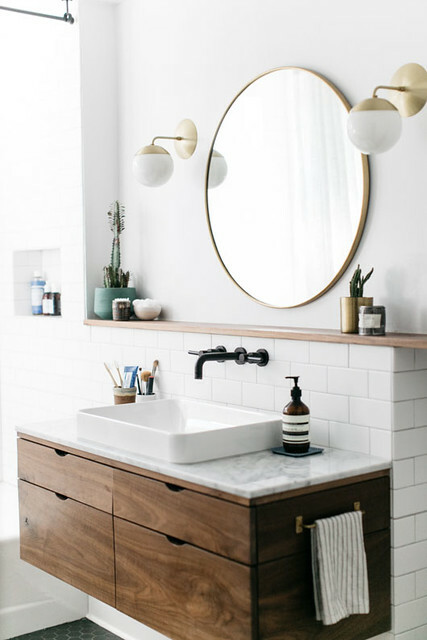 We would consider a DIY modern vanity like the one above or repurposing a dresser like the one below. 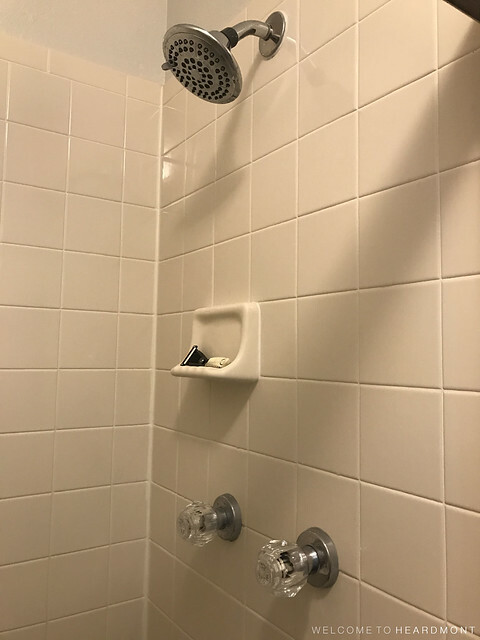 I’m still trying to determine if our shower doors could be removed and replaced with a shower curtain. I love this green one! 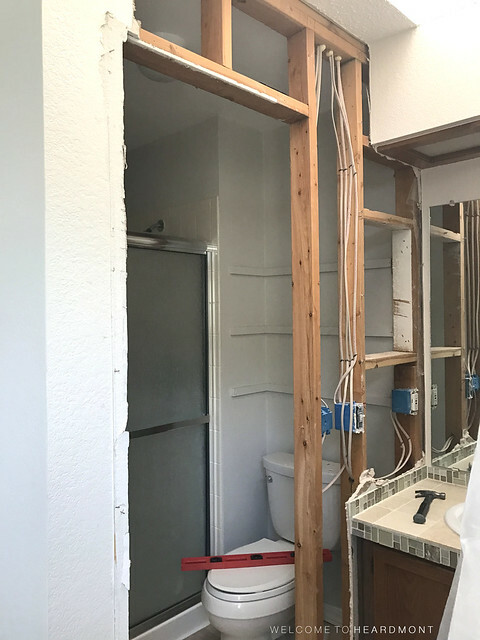 I actually wrote most of this post before this past weekend, and if you caught my instagram stories on Saturday, you know that we started work on the bathroom already! It took some convincing, but we are going with either Option 2 or Option 3. We’re taking out the wall! Stay tuned for more progress – here and on facebook and instagram. Hey guys! 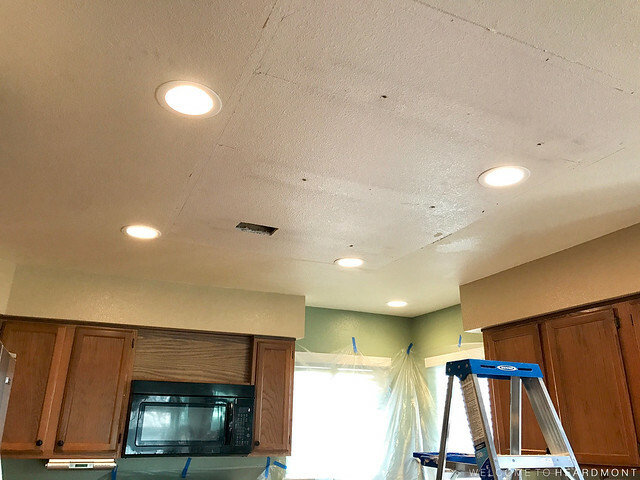 Today I wanted to share a bit more progress in our kitchen after our recent lighting project. Like I mentioned in that post, I decided to take the update a step further and paint over the two-tone green and tan walls from the previous owners. As a reminder, here’s what the kitchen and breakfast nook looked like when we moved in. Once we replaced the fluorescent light box and painted the ceiling, it was time to tackle the walls. I never thought I’d want to use the same paint color in every room of my house, but this house is super open. 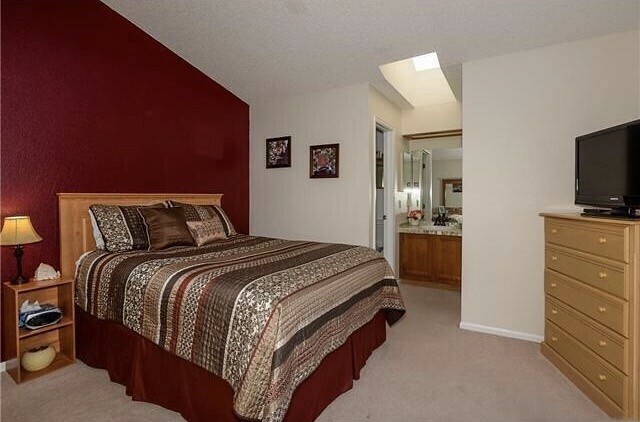 You can see basically every room except the master bedroom from the center of the house. With so many rooms visible from so many vantage points, I wanted the wall color to fade into the background instead of chopping up the flow. That being said, it was time to paint (Silver Drop by Behr). After a couple of coats and putting the room back together, here’s how the kitchen looks today! Here’s a closer look at the finished ceiling with the new wall color. 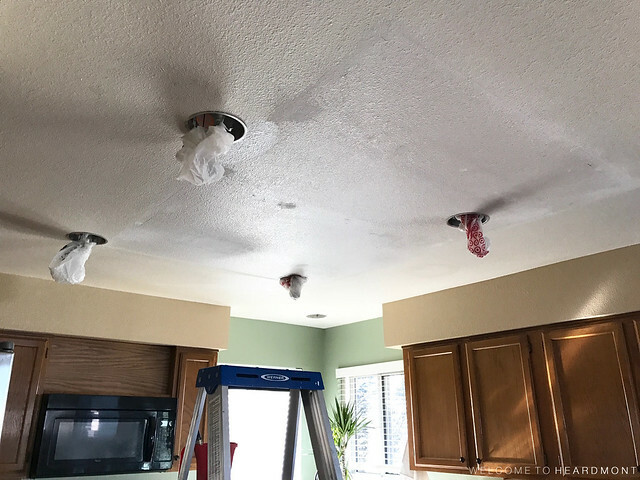 The ceiling isn’t perfect, but it’s pretty darn hard to tell those can lights aren’t original. I still can’t believe we waited so long to make this update! This shows one of the new lights and the previously existing can light in the corner above the sink. 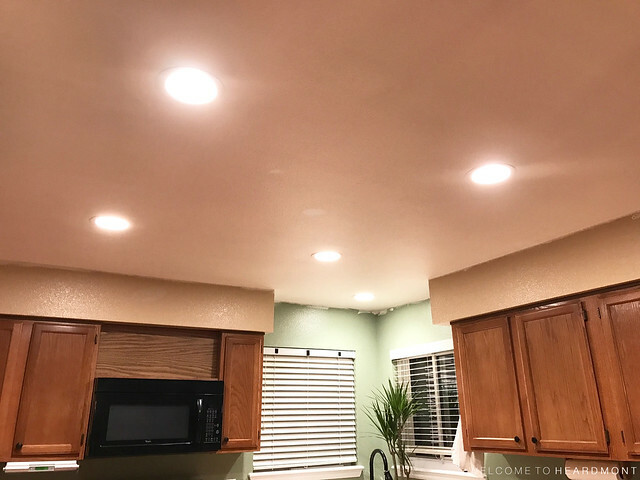 We replaced a yellow-trimmed CFL bulb in that corner with a CREE LED recessed downlight to match the other four we installed ourselves. Now for a quick tour of the kitchen, along with some changes we’d like to make! You enter the kitchen from the sitting room and see the pantry and fridge wall on your left. One project I’ve been brewing on for awhile is adding a more effective bulletin board/ chalk board/ magnet area to this side of the pantry. 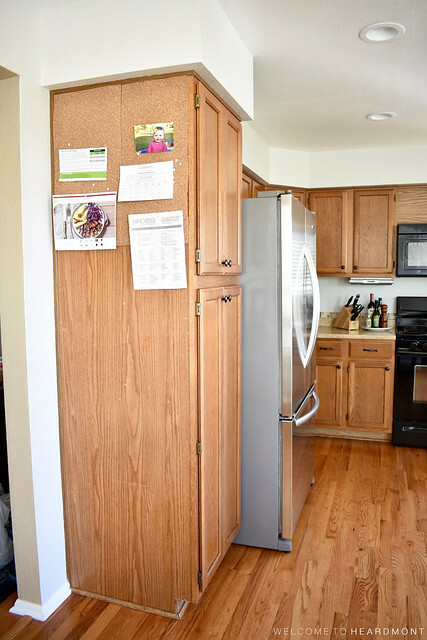 I’ll probably update this area soon, but for now the small corkboard is a great place to tack up a few photos and recipes, along with our Whole30 Shopping List (call us crazy but we’re back on Whole30, y’all!). We brought the stainless fridge with us from Arkansas (see it in our old kitchen HERE) and still love it as much as we did then, even though it’s huge. We got lucky that it barely fit into the existing space when we moved in! 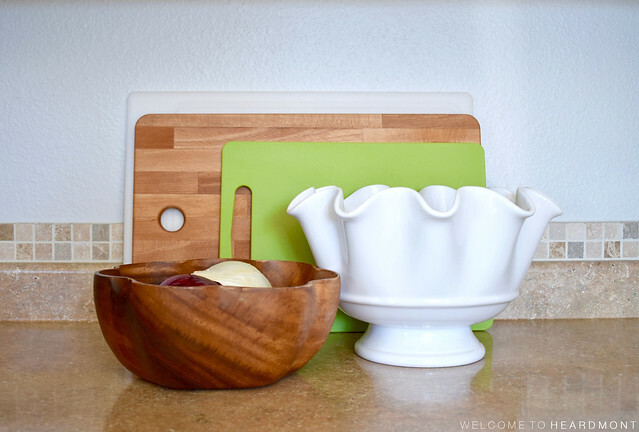 We keep veggies and cutting boards on this side of the kitchen for easy peeling, chopping, and Instant Pot-ing. We must have been light on groceries the day I took these photos because that white bowl is usually overflowing with potatoes and sweet potatoes with a few types of squash on the counter beside. Our grocery-purchasing style has definitely changed since we started Whole30 and have had to cook at home more often. 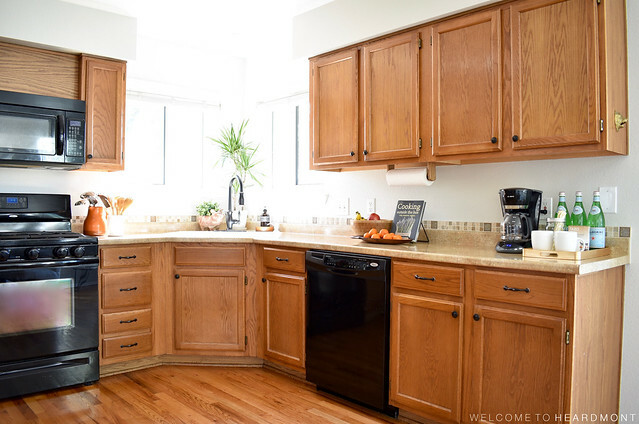 It may go without saying, since we painted the cabinetry in our Arkansas kitchen, but I’d love to update these oak babies with a fresh coat of white (or white uppers with contrasting lowers). 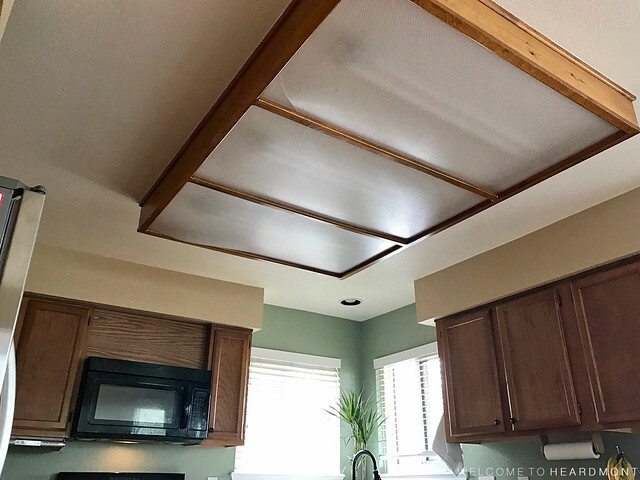 I’d also really love to remove the soffit above the cabinets and extend the cabinetry to the ceiling or figure out a way to disguise the soffit like we did in our old kitchen. Whether that will happen will depend on budget and how labor-intensive it will be, since we’d do it all ourselves. On this side of the kitchen, we store the everyday-use items: plates, bowls, cups, kids dishes, and baking dishes. We also have a little drink station next to the coffee pot, and you can barely make out our little brass “beer bear” bottle opener on the side of the upper cabinetry. 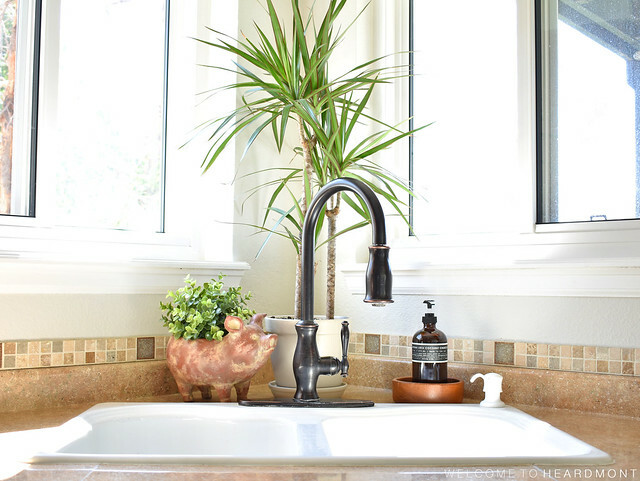 I always wanted a sink under a window that looked out into the backyard, and I found that in this house! 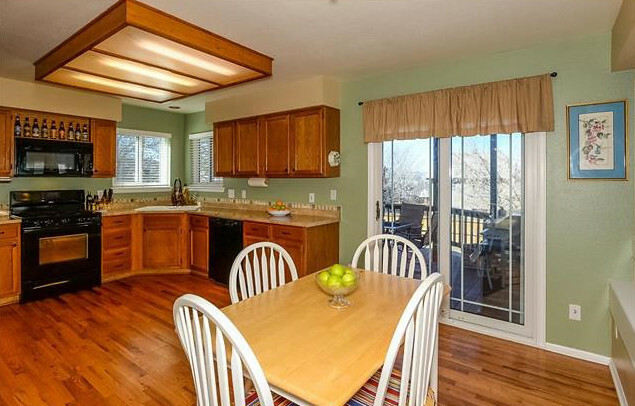 It’s almost perfect, except the sink is set pretty far back into the countertop. I’m only 5’2″, so it’s quite difficult to reach the back of the sink, not to mention the countertop behind it. Don’t even get me started on washing dishes at this sink when I was 9 months pregnant! Impossible! Eventually, I’d like to remove the square tile border on the wall and replace it with a full tile backsplash. We want to wait to tackle the backsplash until we decide if the current countertops will stay or get the boot during our next reno phase. 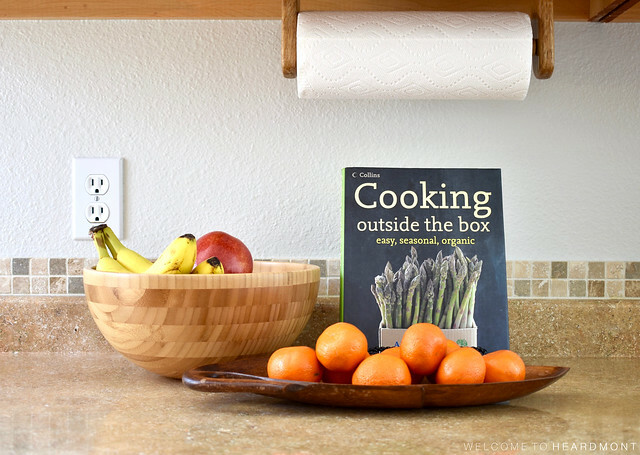 We keep fruit close to the sink to make washing and snacking easy. Stephen found this cookbook years ago, and I finally picked it up the other day and started using it. It’s got great tips on how to “throw together” meals using what you have on hand, for each season of the year. Our breakfast nook is an open area at the end of the kitchen with a sliding door to the back deck. I had patterned curtains hanging over the sliding door before we painted but haven’t hung them back up yet. I love the light, bright look without the busy pattern, so I might end up replacing them with white or light-colored linen ones instead. Our round table works so well here, but we’ve realized lately that it’s getting hard to host with a table this size. Having friends to dinner a year ago might have consisted of us and another couple, plus a highchair for Libby. Now, a typical dinner with friends requires at least six chairs for the adults and big kids, plus two or more boosters for the littles. 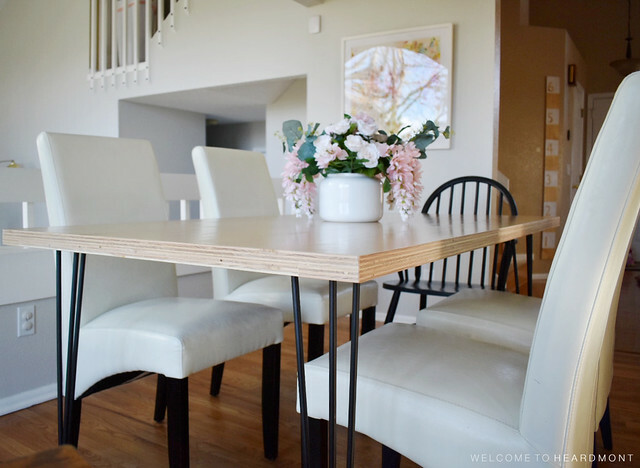 Since we got rid of our dining room in favor of our new sitting area, we’re on the lookout for a rectangular table for this breakfast nook that can seat at least eight. This shot really highlights how open our floorplan is. To the left is the den with a hallway to the laundry area and basement and to the right is the sitting room, playroom, and front door. You can even see our upstairs landing, linen closet, and the kids’ bathroom door through that railing up above. 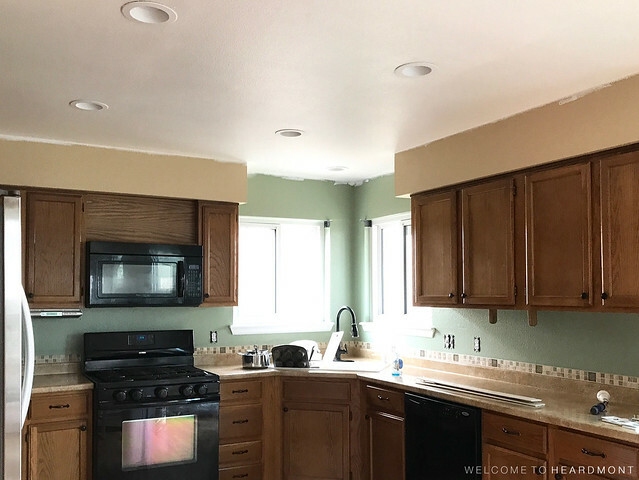 Now that the kitchen has been painted, I’m so motivated to banish the beige for good and paint the tall walls in the front of the house. The art is That Bowtie I Like by Michelle Armas and I luuurve it. It was a Christmas gift years ago, and it’s slowly made its way through the several rooms in our house; you can see it in our master bedroom in Arkansas, Libby’s old nursery, and Libby’s nursery in our new house. Looking back on those posts, I realized I’ve designed more than a couple rooms off of this painting! So that’s a look at our kitchen post-lighting and paint and pre-whatever updates come next. I mentioned on Instagram the other day that I’ve had sooo many house ideas buzzing around in my head lately, it’s hard to pick a direction and GO! We also have lots of weekends booked this summer, but I’m going to do my best to eek out some house projects between trips. How about you? Are you using summer to get projects done or taking much needed time off? 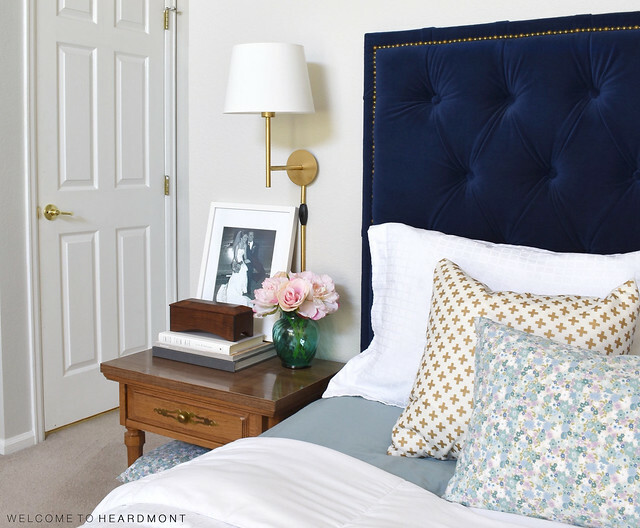 Slowly but surely, we’re checking projects off our to-do list here at Heardmont. 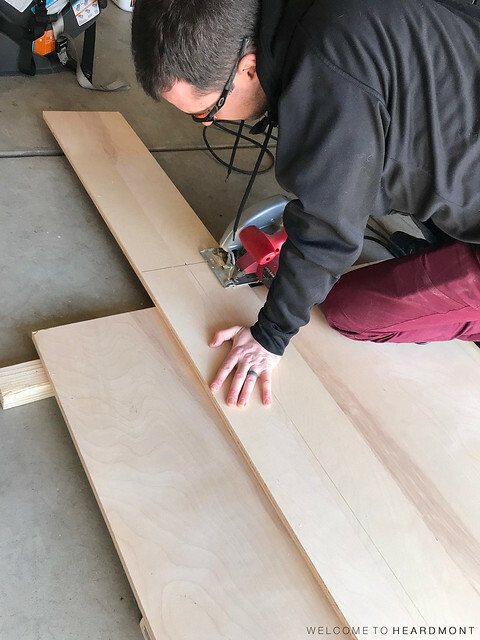 With most projects around here, we tend think and stew on them for a while and then tackle them full-force over one weekend until they’re done. Our latest lighting project was no different. 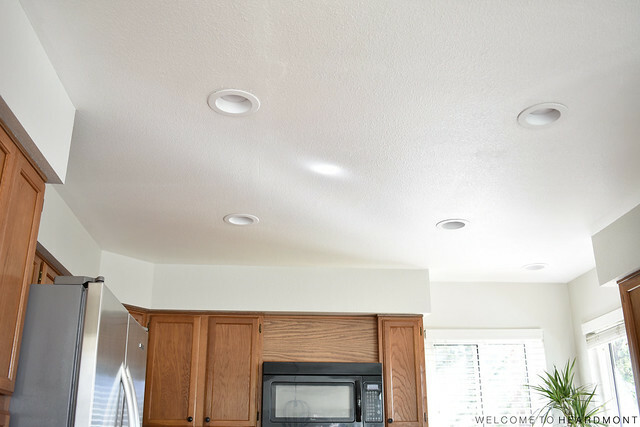 We decided to replace the huge fluorescent light fixture in our kitchen with recessed lighting. Call them what you want – can lights, pot lights, or recessed lighting – but I’ll take any of them over the light box that lived in our kitchen until recently. 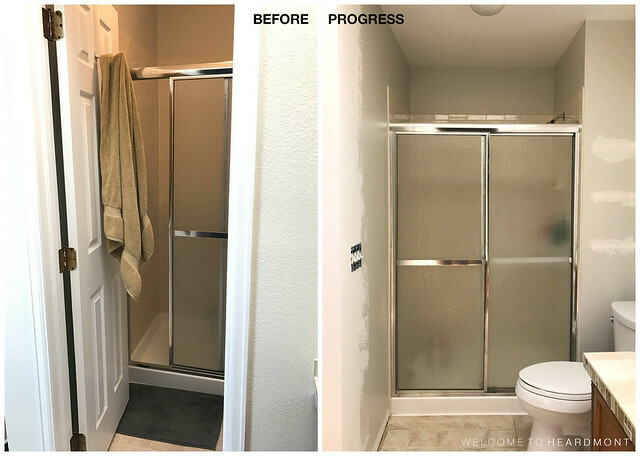 We actually tackled a very similar project in our first house (a one-story ranch), but we were hesitant to attempt this one because our current home is two stories. This meant that we couldn’t wire the fixtures in the open attic above the room like we did back in Arkansas. Read on to see how we made it work this time around. Here’s a closer look at the offending fixture. You might notice that one of the plexiglass panels was actually cracked; I honestly can’t remember if it was like that when we moved in or if we cracked it trying to determine how easy it would be to remove. Either way, it wasn’t too upsetting, knowing that we’d be ripping out the fixture as soon as we found the time to do it. Disclaimer: we are not professional electricians. Please follow this tutorial at your own risk and consult or hire a professional if necessary! 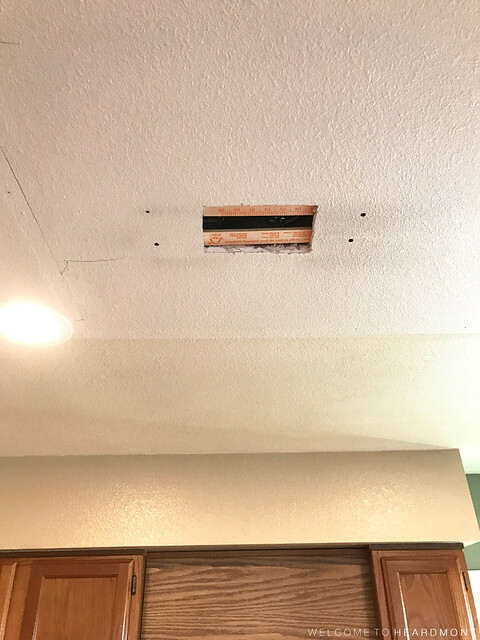 Here is how we took down the fluorescent box, replaced it with recessed lighting, and made our kitchen ceiling feel about two feet taller. To take down the fixture, we first removed the plexiglass panels (they were just floating in the frames). Then, WITH THE POWER OFF, we unscrewed and disconnected the three fluorescent fixtures. 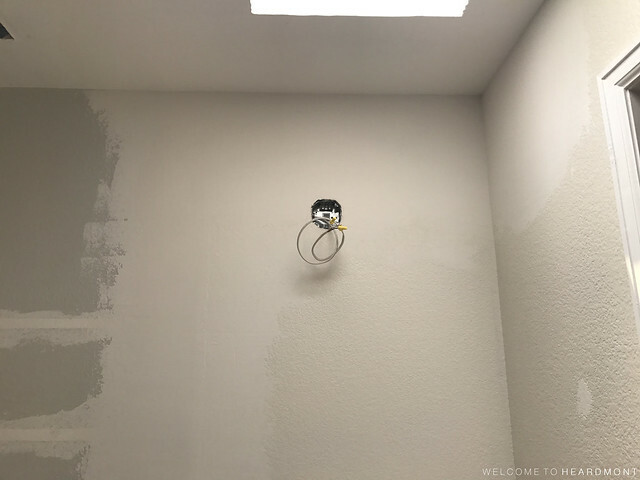 There were wires running between the fixtures, but all that was left after we took them down was one power cord coming out of a rough hole in the ceiling. 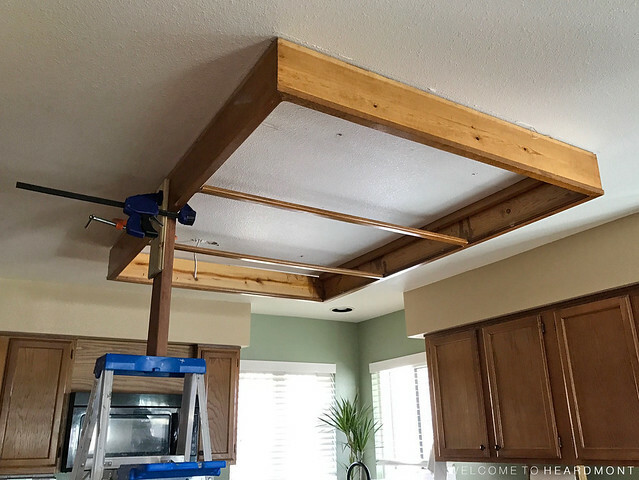 The wood frame was really heavy, so as we unscrewed it from the ceiling, Stephen built this brace with a 2×4 and clamps to make sure it wouldn’t fall on us as we pulled it down. 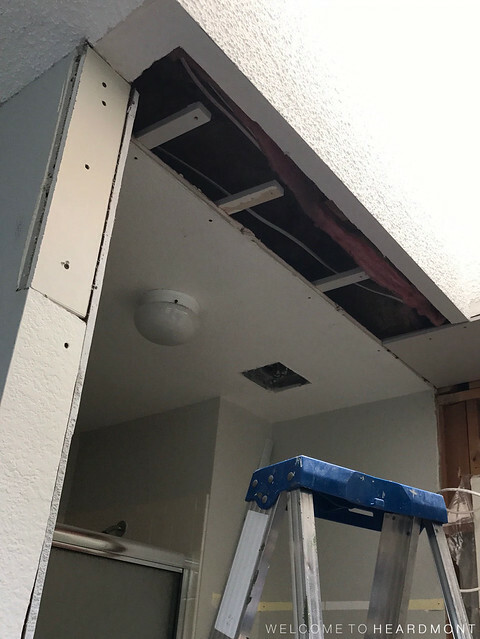 Once the frame was down, we got a closer look at the condition of the ceiling and determined which way the ceiling joists ran. 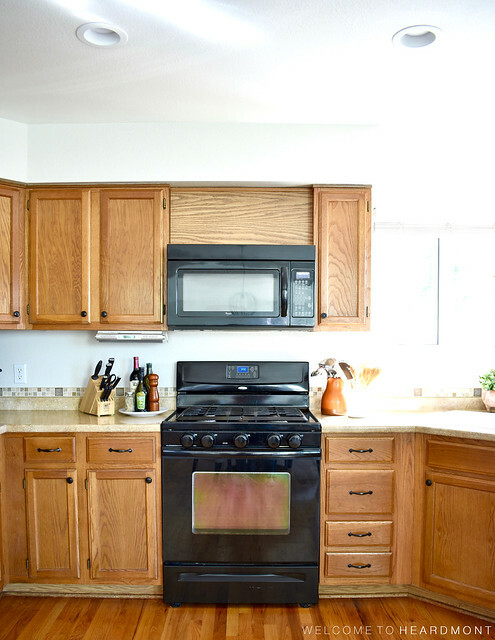 Ours ran parallel to the stove/microwave wall, which helped us decide where we should place the can lights. 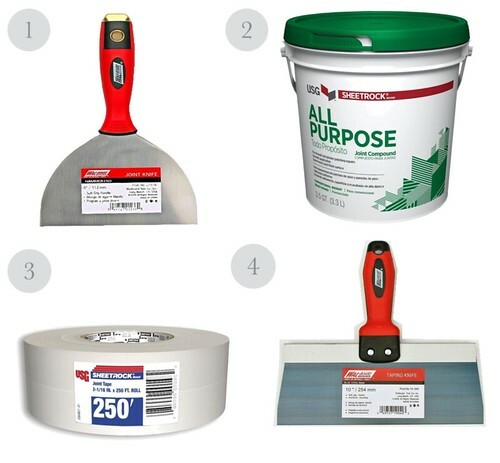 Before we get into the “how to” of installing recessed lighting, here are the supplies we used. 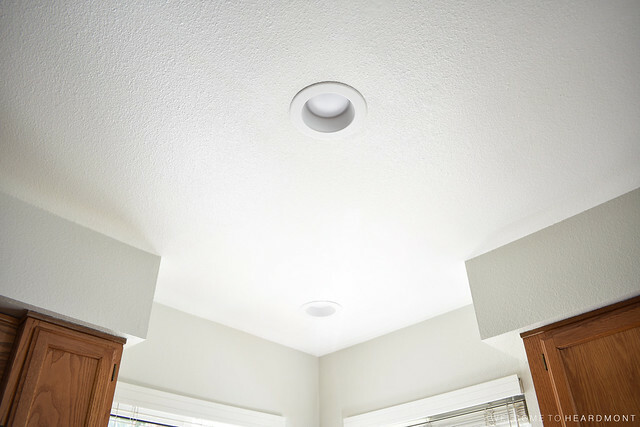 Each light housing includes a template you can use to determine the placement of your can lights on the ceiling. 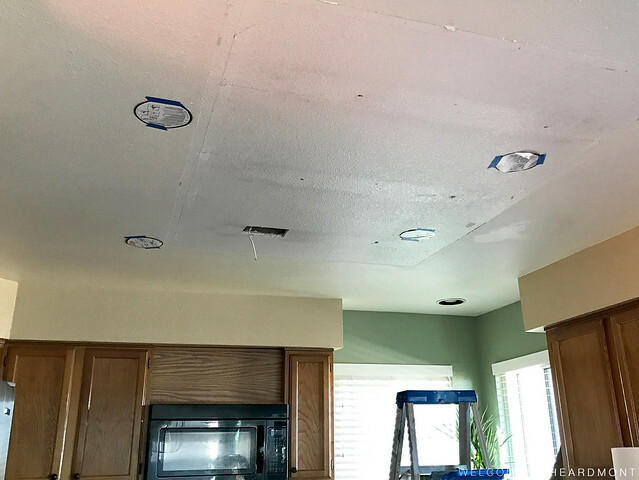 We originally purchased six housings and six LED lights but chose to install only four based on the spacing on our ceiling. We did use the fifth LED to replace the CFL bulb in the light above the sink so that all the bulbs would match. After the photo above was taken, we decided to move the template in the far corner further out so that the layout of the four lights would form a rectangle. 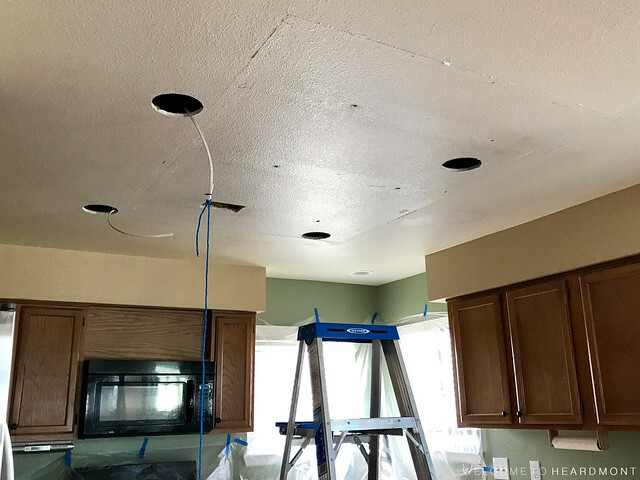 Once we were happy with the placement of our lights, we traced the templates and used the drywall saw to cut the circles for each of the housings. 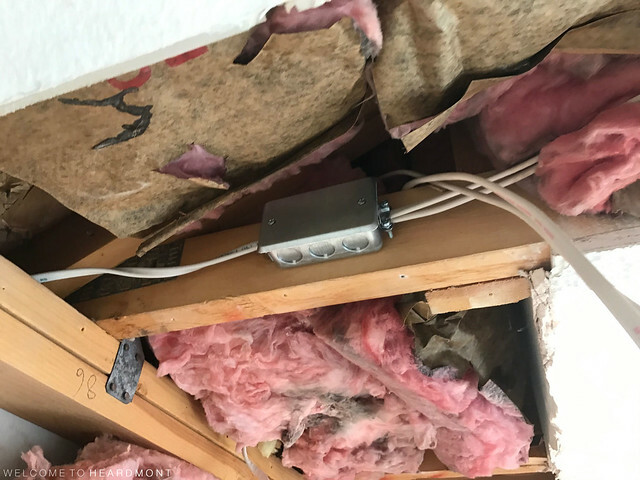 Then we attached the junction box to the joist inside the rectangular hole in the ceiling, with the power cord you see here going into one end of the box. Running the wire to each hole was probably the trickiest part. Here’s a diagram I drew showing how we did it. Wiring is in red with the wood ceiling joists in blue. 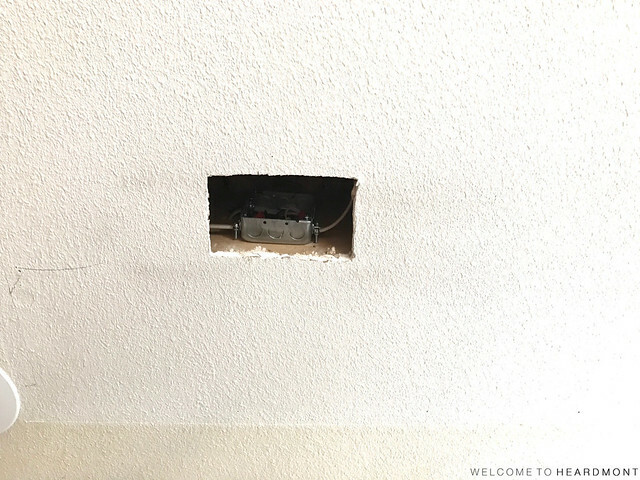 The junction box (where the power comes to the room) is located at the rectangular hole with power going out in two directions. The two lights on the left then connect to the two lights on the right. We ran the power this way so that we’d only have to thread the wire through a hole in one joist for each pair of lights. See how the red lines from the junction box only cross one blue line each? Here’s how the same view looked after we’d run power to the two lights on the left. 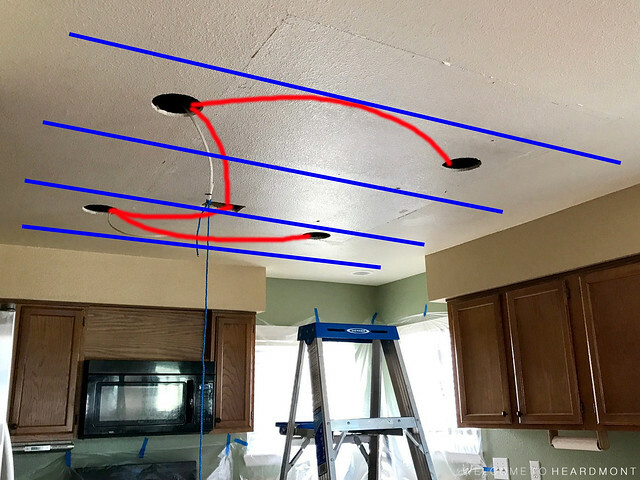 Getting the wire to each of these two holes required drilling a 1″ hole in each ceiling joist and threading the wire through. You can find easy wiring diagrams online to show you how to connect the wires at the junction box. 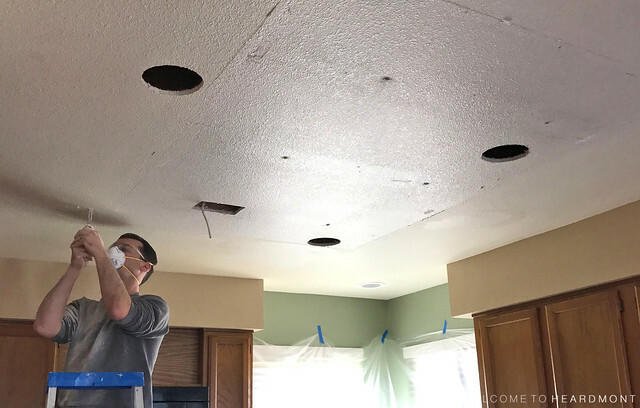 Once all the wiring was in place, Stephen connected a recessed light housing at each hole using wire strippers and wire nuts. The housings came with a wiring diagram to show how the wires should be connected. Finally, after the housings were installed, we attached the LED lights. 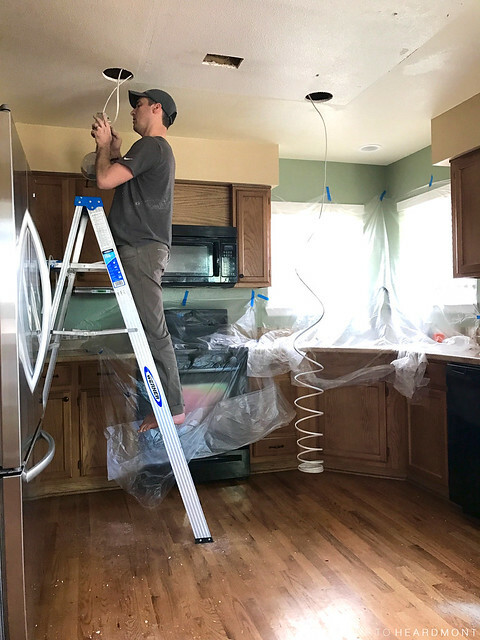 The bulb and white trim come as one piece, so installation was pretty simple – flipping out some tabs and screwing the bulb in. We chose soft white CREE LED fixtures to conserve energy. At this point, we turned the breaker back on to test the lights. It’s always a feeling of accomplishment (and relief!) when you flip that switch and they actually work! 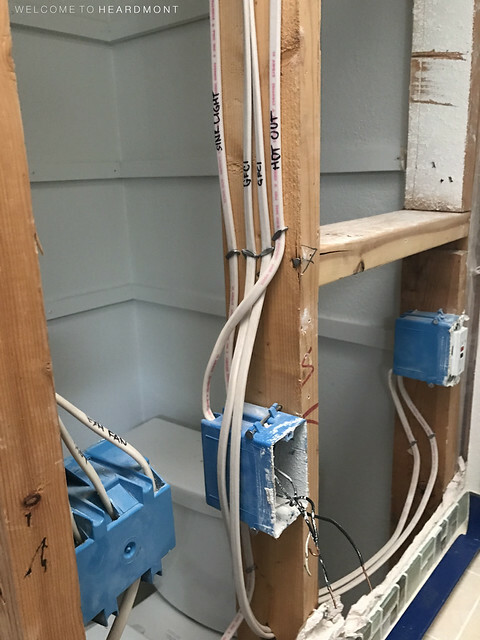 Once we knew our wiring worked, we addressed the junction box and drywall repair. We used the cable clamp connectors in the junction box and closed it up with the 4″ blank cover linked above. 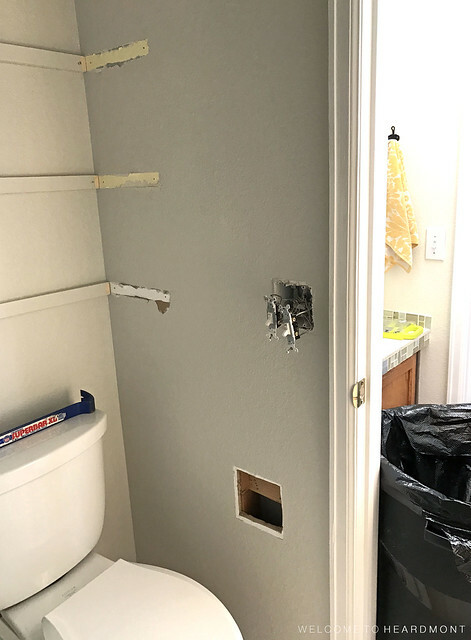 Because this hole was large enough to require a full drywall patch, we attached two braces across the hole. Our braces are actually just the long paint stirrer sticks from Home Depot, which was a tip we picked up from one of the associates there! 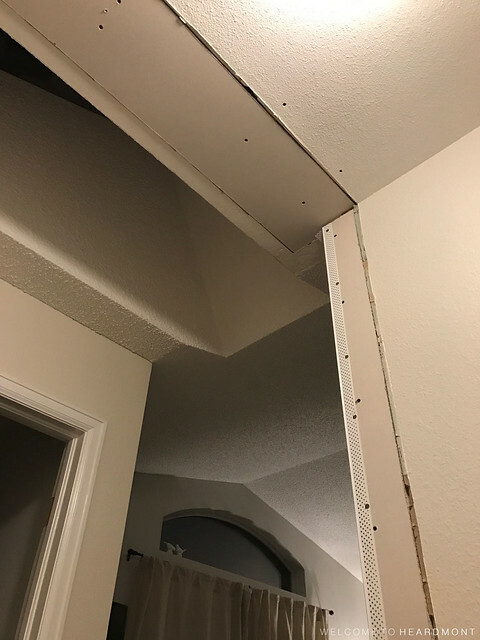 We cut the drywall patch, dry-fitted it, and attached it to the braces using drywall screws. 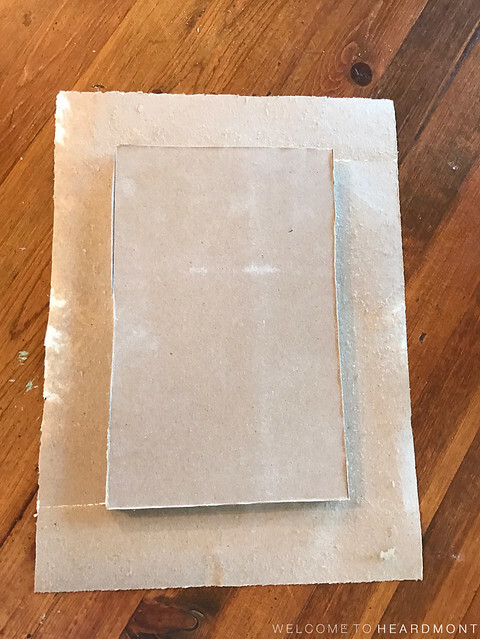 I wrote a really extensive tutorial on creating drywall patches like this one HERE. After the patch was spackled (this is my absolute favorite spackling), I applied orange peel texture to it and around the border where the previous light box met the ceiling. This stuff on the medium setting did the trick! 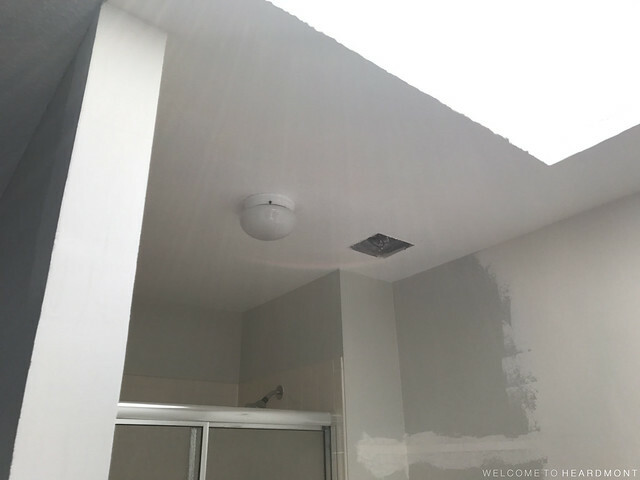 You’ll notice we also removed the lights prior to applying the texture and … drumroll … painting! Here’s a glimpse at our newly painted ceiling, free of all fluorescent lighting! 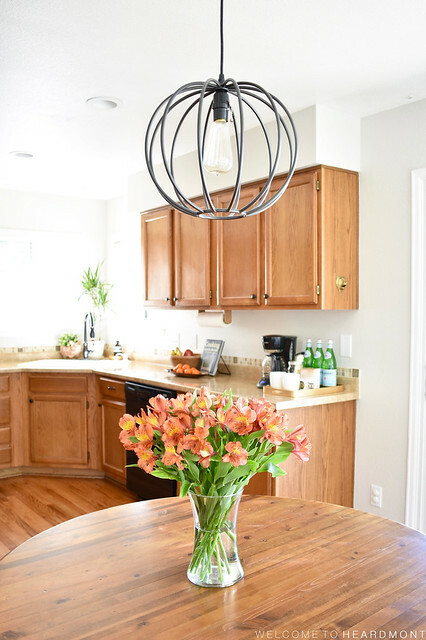 I honestly can’t believe how long we waited before we made this relatively quick and inexpensive update (under $200) or how much better and brighter our kitchen looks now! Of course, painting a ceiling is like giving a mouse a cookie, it leads to other painting projects. Stay tuned for a peek at the rest of the kitchen! If you have young children, do they have a designated play area or playroom? Do you struggle to keep the primary-colored plastic toys from overtaking the room (or even the rest of your house)? Today I wanted to share a few things I learned over the past couple years as we furnished and decorated our girls’ playroom. 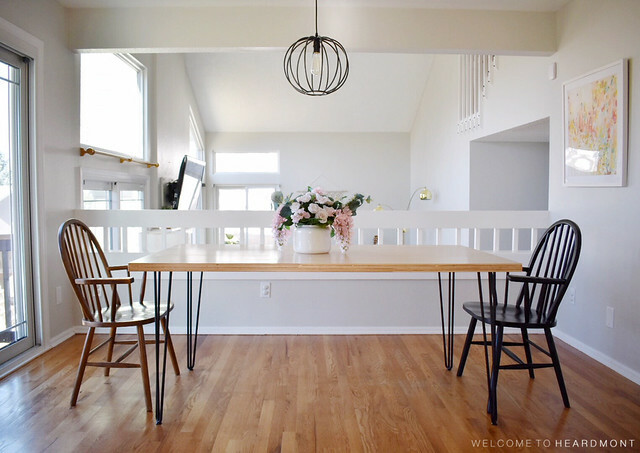 This space is completely open to the rest of our house, and the before and after photos got me to thinking about how many changes we made to get the playroom to where it is today. 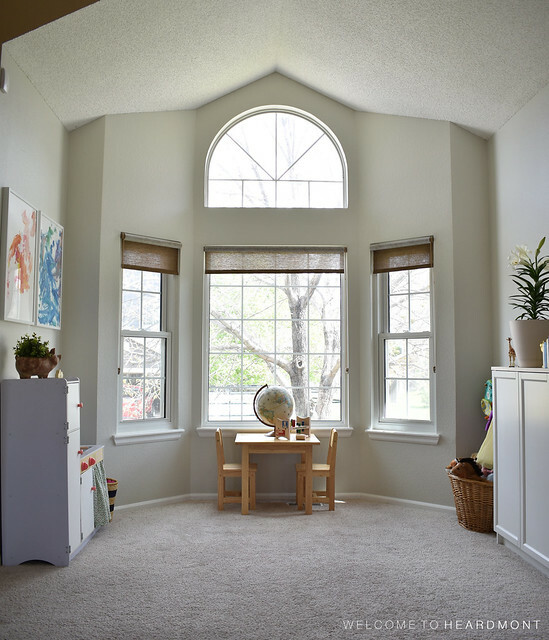 We learned a lot and gave our new solution lots of thought, so here are my top five tips for furnishing and decorating a playroom that flows with the rest of your house. I don’t know how we end up with so many small toys, but they seem to multiply at our house. The playroom really came together when we added two bookshelves with doors to the middle of the long wall in this room. The small toys that used to be visible on our previous shelves are now hidden in this storage unit, and the large toys can stay out without looking too busy. There are various bins and baskets behind these doors to corral the small toys, but since they’re concealed they don’t have to match or be perfectly neat all the time. The play kitchen is another form of closed storage in our space. It easily holds all our play food, dishes, and kitchen accessories and can hide other toys in a pinch. Another excellent way to keep toys looking neat is by storing them in baskets. We like to use baskets for everything from blocks to trains to stuffed animals. The white and natural basket on top of our toy cabinets holds our wooden train set from Ikea and adds nice texture to this surface. Beside the toy cabinet is a huge basket for our stuffed animals. I actually found this one at Goodwill, and it’s super versatile and makes cleaning up so easy. Find a stuffed animal? Toss it in the basket! In the little nook beside the play kitchen, I like to keep a basket for the girls’ mega blocks. These blocks originally came in a pink plastic wagon, which was fun for a little while but took up a lot of room and was pretty gaudy. The basket tucks nicely into this little corner and is unoffensive as far as mega block storage goes. 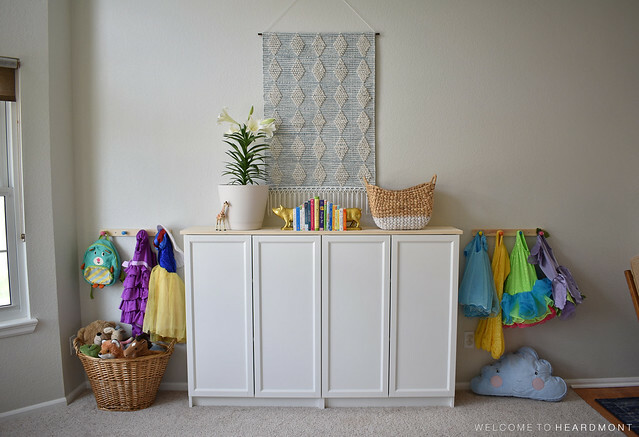 Once the toys are concealed or easily stored, divide those storage pieces into designated play stations. 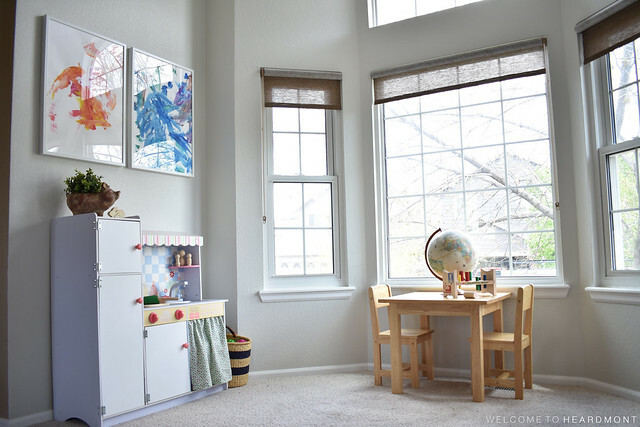 This helps kids know where to find different types of toys, and it gives your eye a place to rest as you look around the room (so you don’t just see one big mass/mess of toys!). 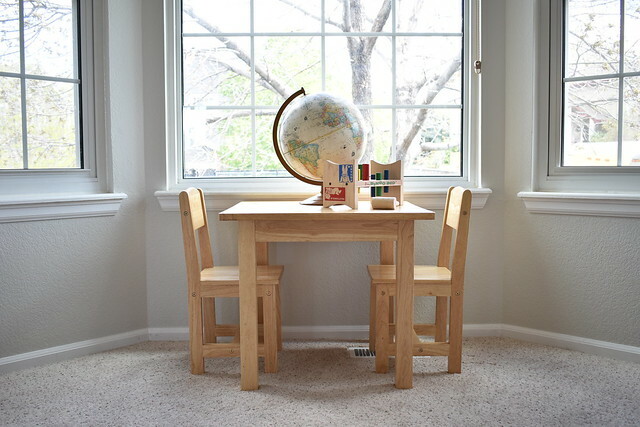 Think outside the box and consider non-kid-specific furniture for your playroom. You should choose furniture you would buy for your home whether or not it would be in a kid space. This tip applies to children’s bedrooms and nurseries as well. 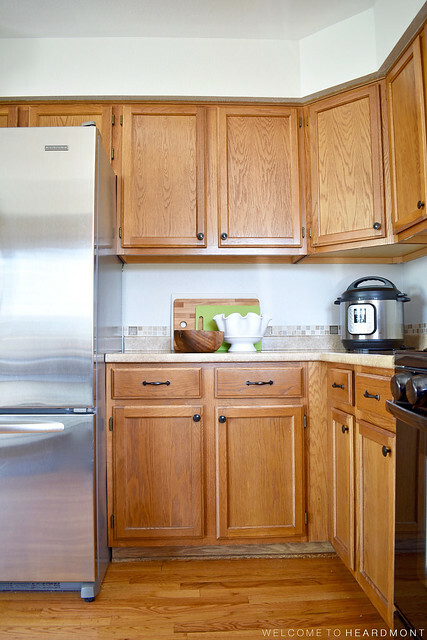 I can see our white cabinets easily becoming a dining room buffet or craft supply storage as our kids get older. When in doubt, don’t buy the primary-colored furniture! While the girls will eventually grow out of this craft table, I made sure to choose a finish that was neutral (natural wood) and wouldn’t distract from the rest of the room. I could see myself buying an adult-sized version of this set for elsewhere in our home in a heartbeat! So what do you do if you’re trying to follow this advice but you already have primary-colored furniture? 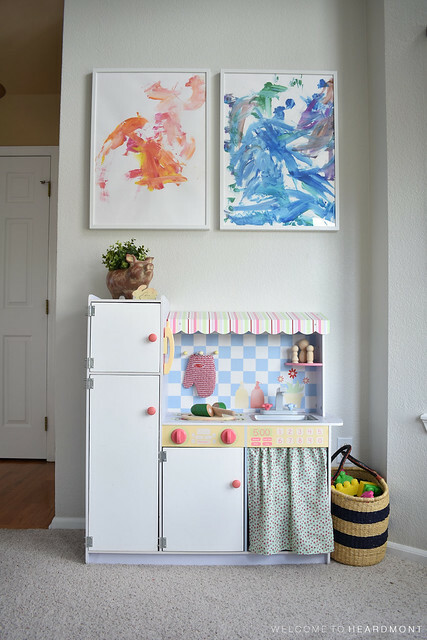 The same thing we did with our thrifted play kitchen – paint it! 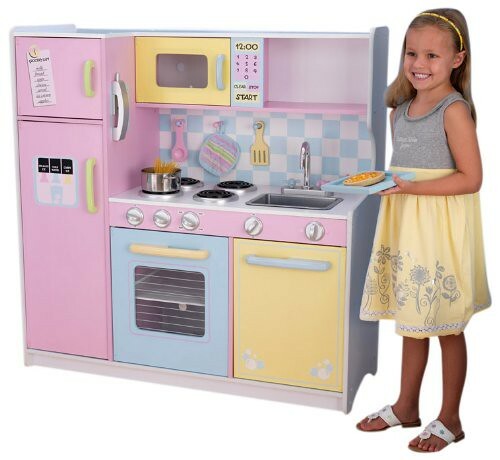 Would you believe the girls’ play kitchen started out looking almost just like this?! Complete with pink, blue, and yellow doors. I found this piece at a consignment sale, so I didn’t have much say in the color palette. Instead of turning our playroom into a pastel wonderland, Stephen and I built new doors (a couple were damaged or missing), painted them white and added a sweet little curtain below the sink. Now the kitchen is still colorful without overwhelming the room. As I was putting the finishing touches on the room, I pulled out the girls’ favorite (and best-looking) toys to style the various surfaces. 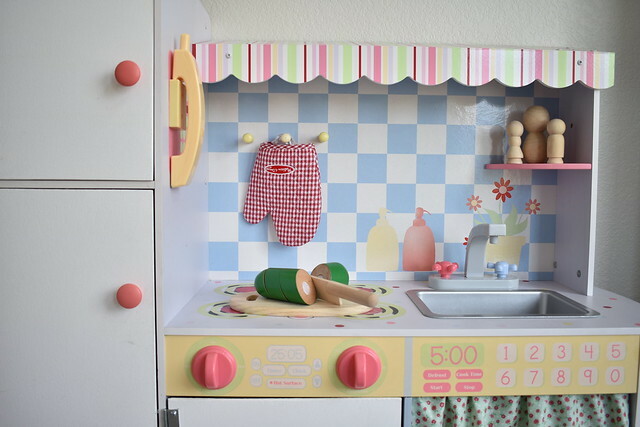 I like to decorate the play kitchen as I would my own kitchen – with cute textiles (the oven mitt and curtain) and fresh fruits and veggies. On the wall above the kitchen, I hung two paintings by Libby in simple white frames. 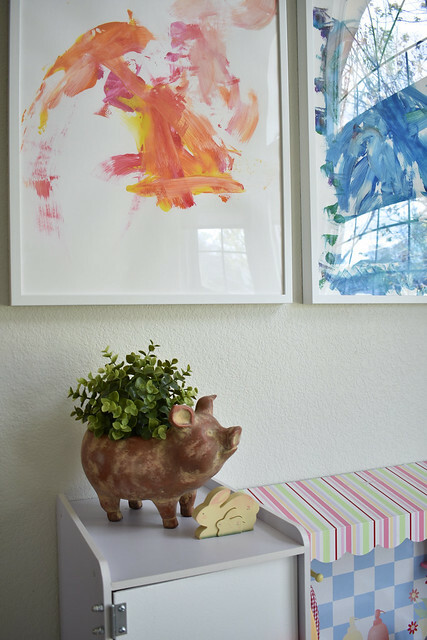 I love that these look professional enough that they could hang anywhere in our home, not just in the playroom. 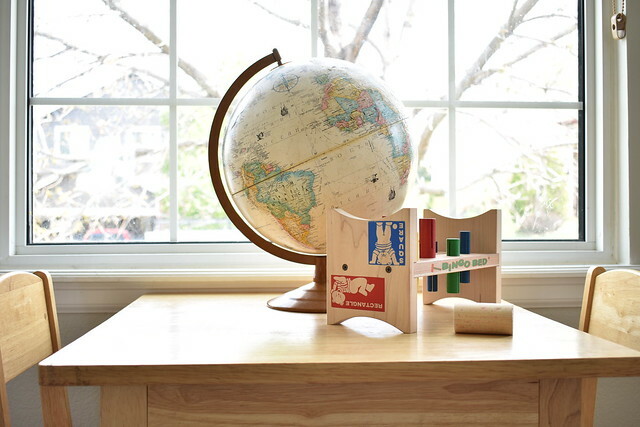 The girls play with this globe and peg block often, and they’re pretty enough to leave out all the time. 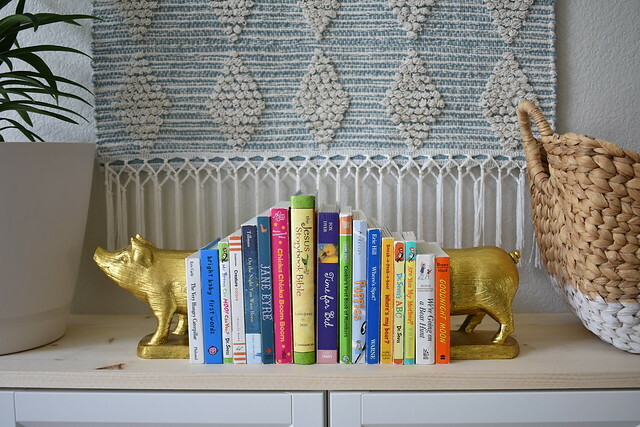 I even borrowed bookends from our own bookshelf for the top of the toy cabinet. 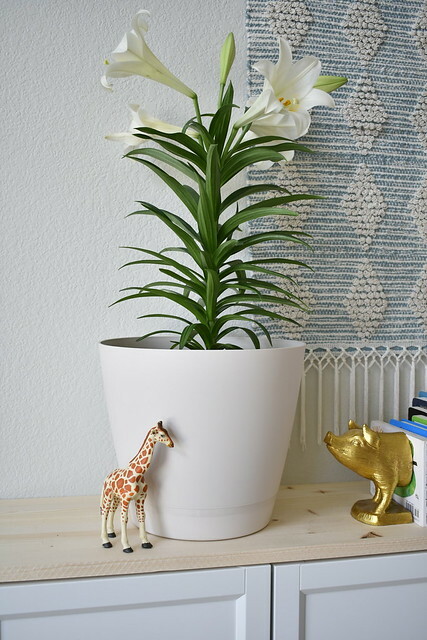 You know playroom decor will flow with the rest of your house when you decorate with items you love from other rooms. 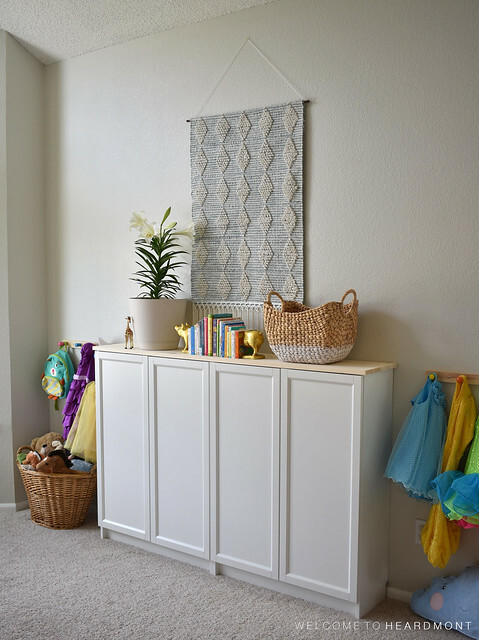 So those are my tips for creating a playroom that flows with the rest of your house: choose closed storage, use baskets, create play stations, select neutral furniture, and decorate it like the rest of your house! What do you think? 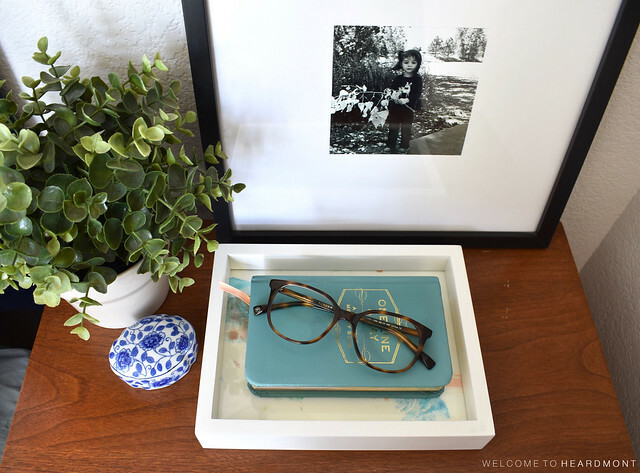 Will you implement any of these tips to improve your space? I’m adding our source list for this room below. Thanks for reading! Some links in this post are affiliate links. My husband Stephen and I moved from Arkansas to Denver, CO in 2014, and we are loving life in our new state with our two little girls. 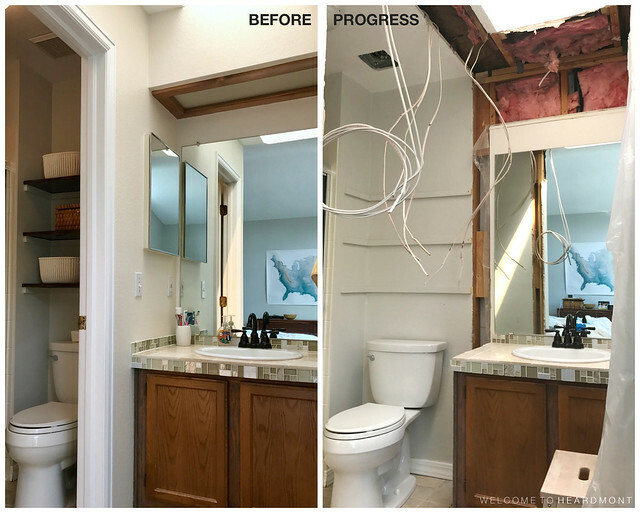 I always have a project up my sleeves and love sharing renovation tips and tricks on my way to Before & Afters. I love inspiring others to tackle DIY projects because being proud of where you live starts with saying "I did that myself!" Welcome to Heardmont - I'm so happy you're here!